Karen@cofq.net with all questions, special requests, cost inquiries-no obligation of course! 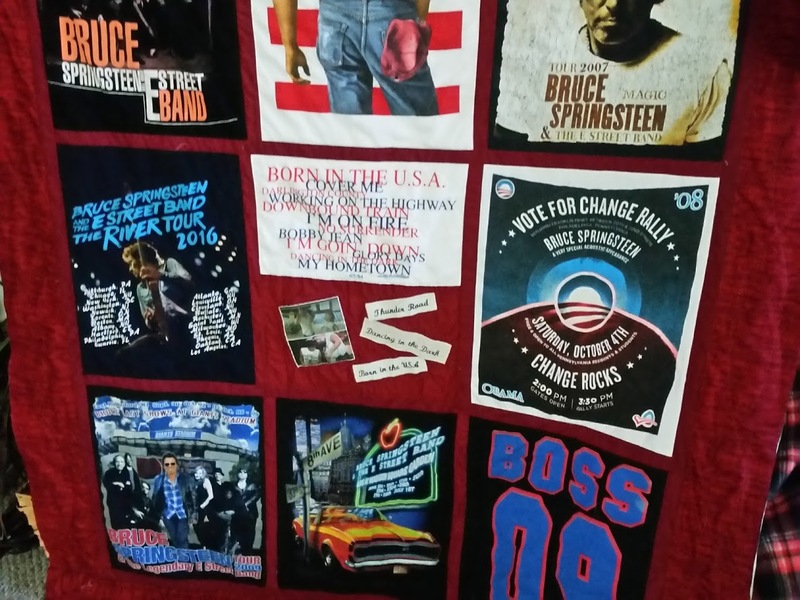 Clothing Items, Photos and More! 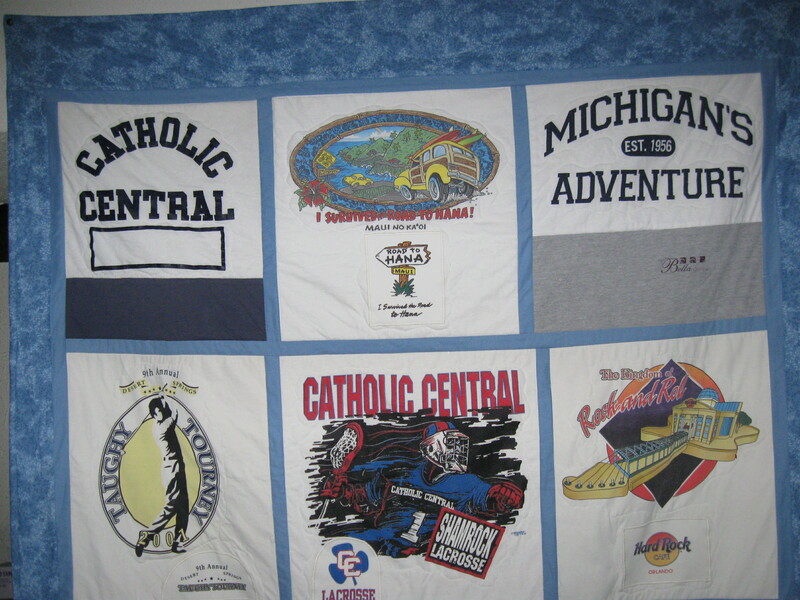 front and the back, that counts as two T-shirts or panels. If the Tee only has a small logo to be used, don't count it. Each clothing item aside from Tee's counts as one. warmth and comfort unless otherwise requested. 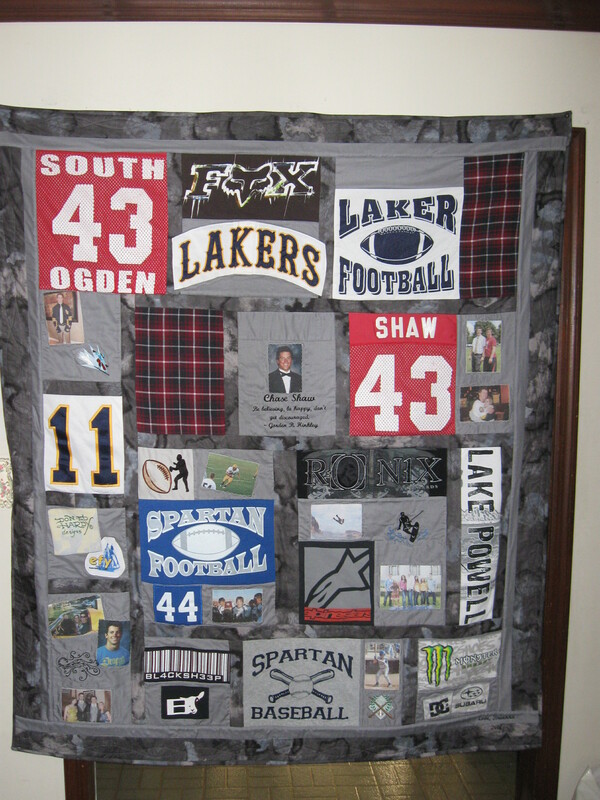 1 or 2 Photos plus Embroidered Wording may be added. 2" Fabric Ruffle or plain edge available. 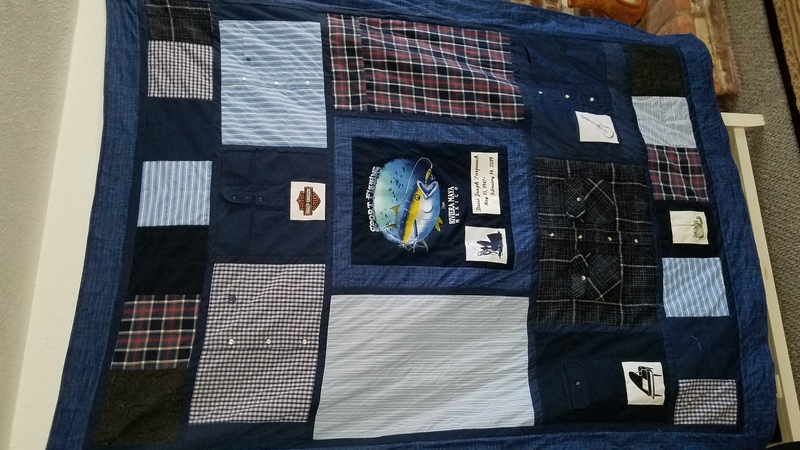 Pillow Cover made using Men's Ties! 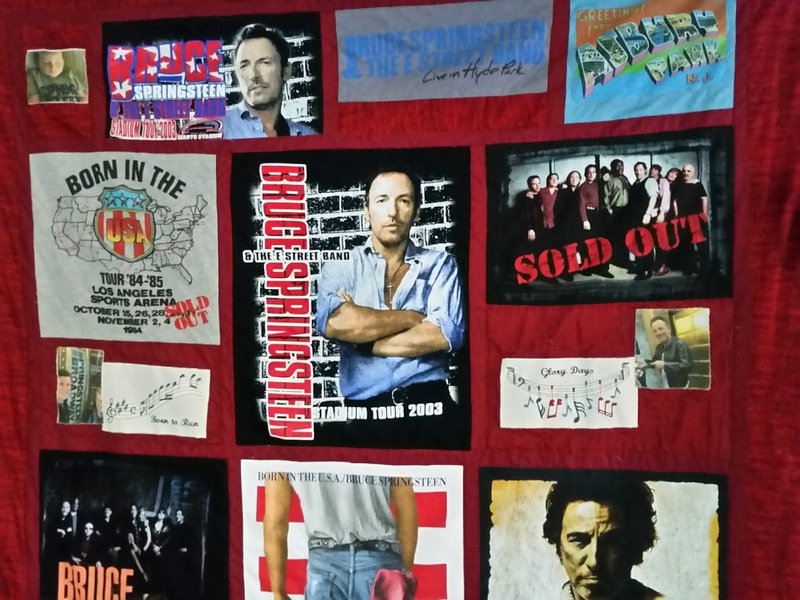 and more to your Quilt-just ask! 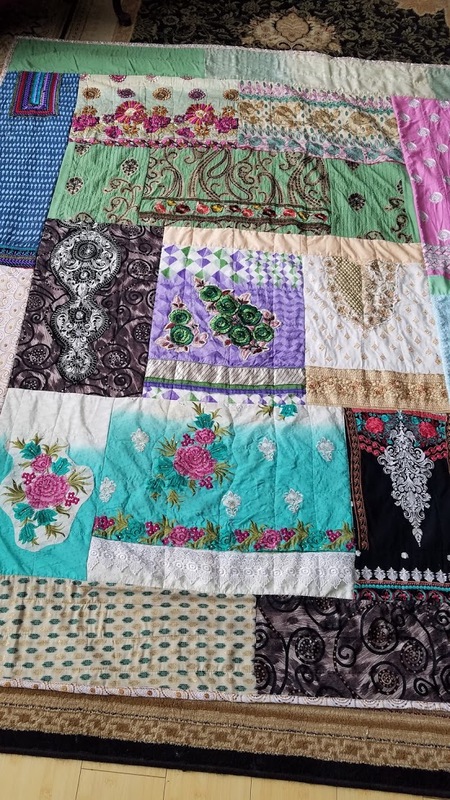 The Salwar Kameez Quilt is a great way to feature and capture the beautiful, larger designs and embroidered detail used in these delicate clothing 'fabrics'. 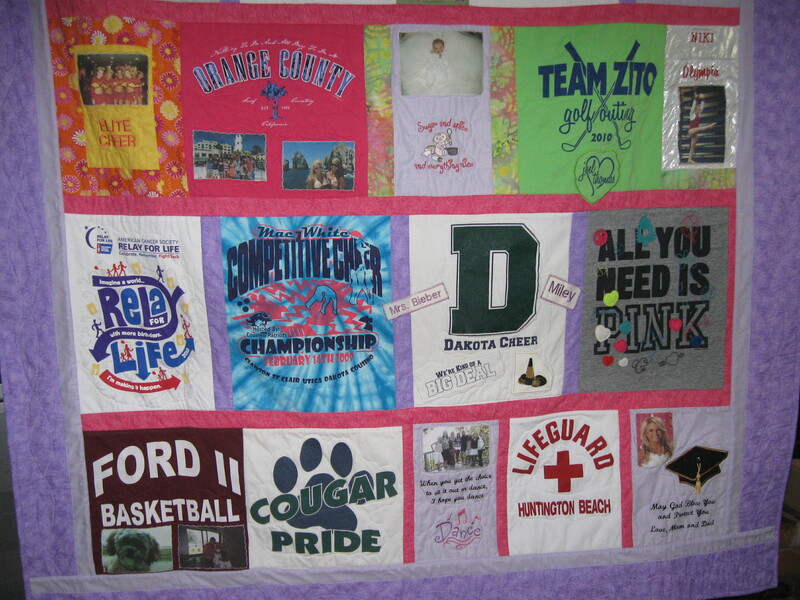 A great way to display your favorite Tee's and offer a cozy Quilt to cuddle up in!
' 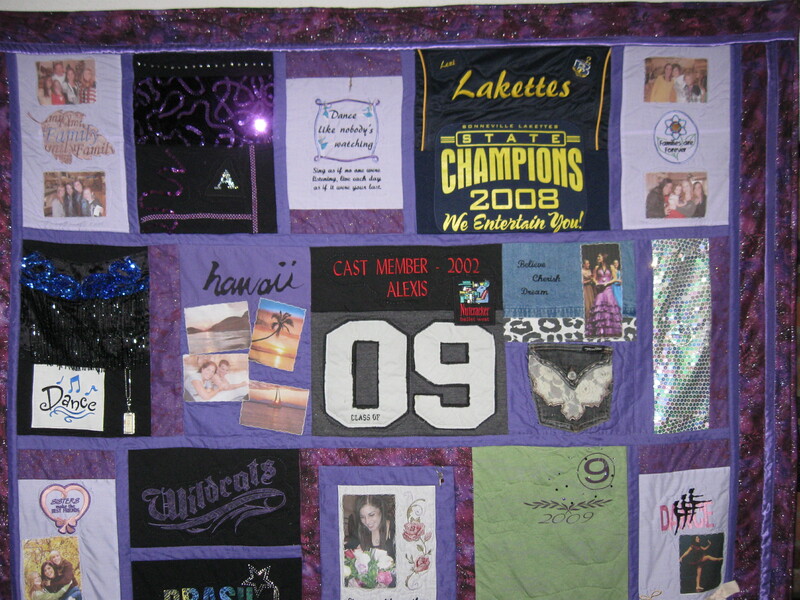 Photos, Embroidered Wording and Designs may all be added. Most sizes available, just ask! 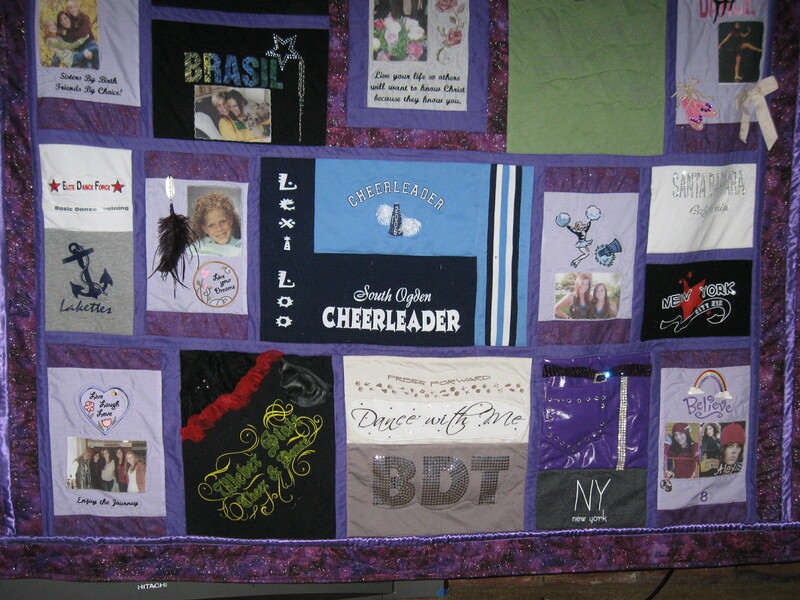 Done in your choice of colors, any size with any number of photos added! 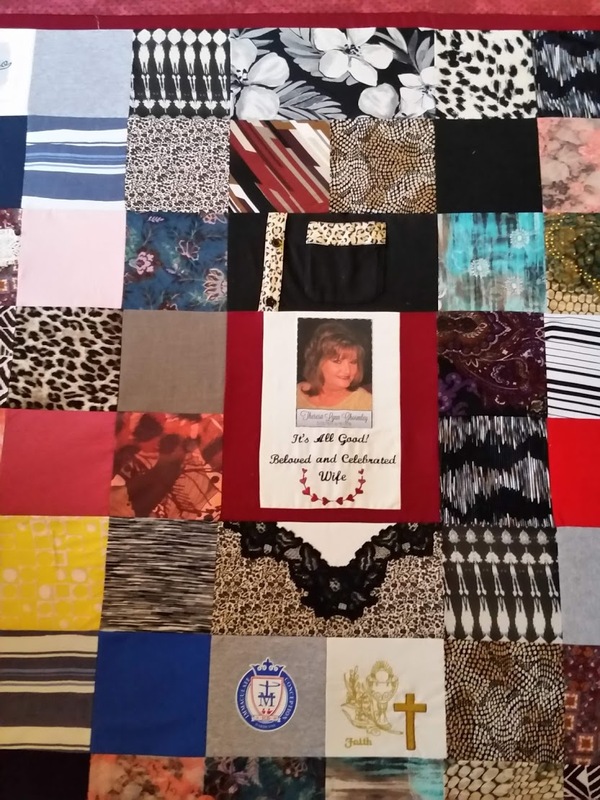 This Quilt 50 x 65"
These Quilts 45 x 60"
A piece from each garment sent will be used whenever possible. 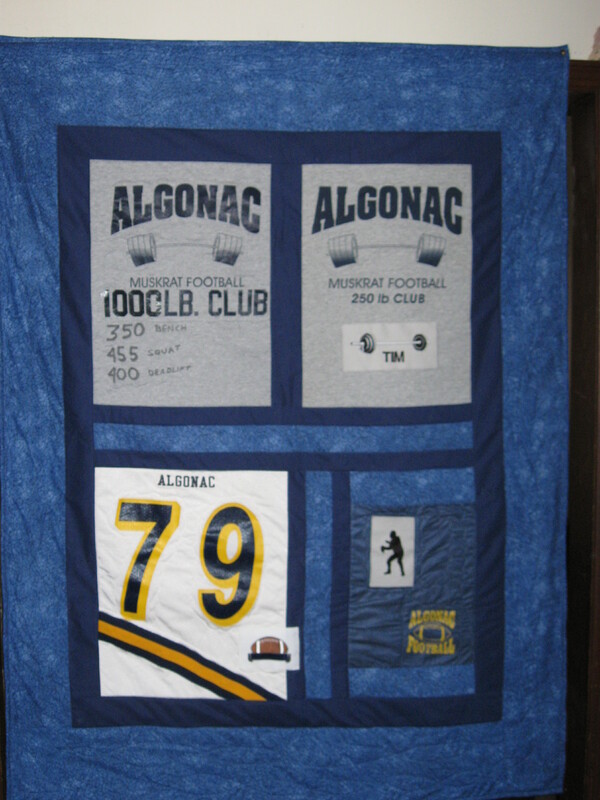 Adding a pocket is the perfect place for a small token, piece of jewelry, note as a special memory. 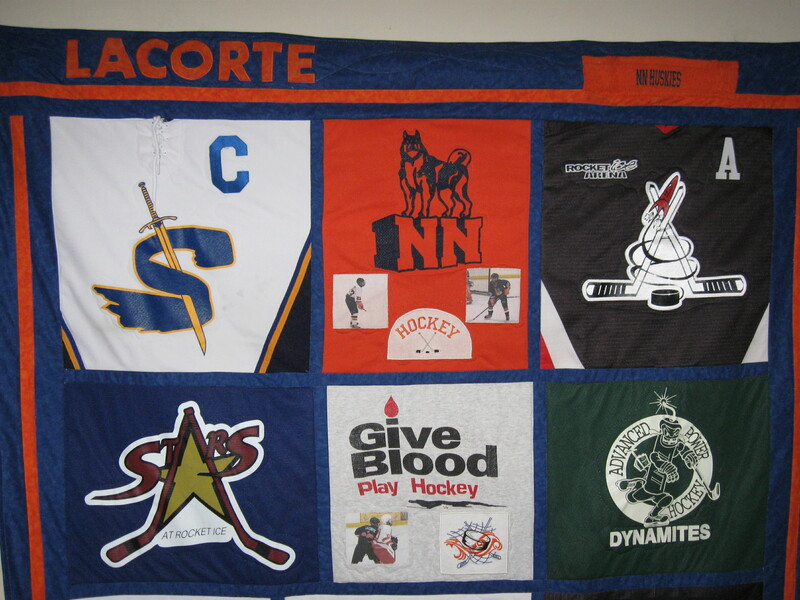 T-Shirt Quilt using both the larger designs and the logos. 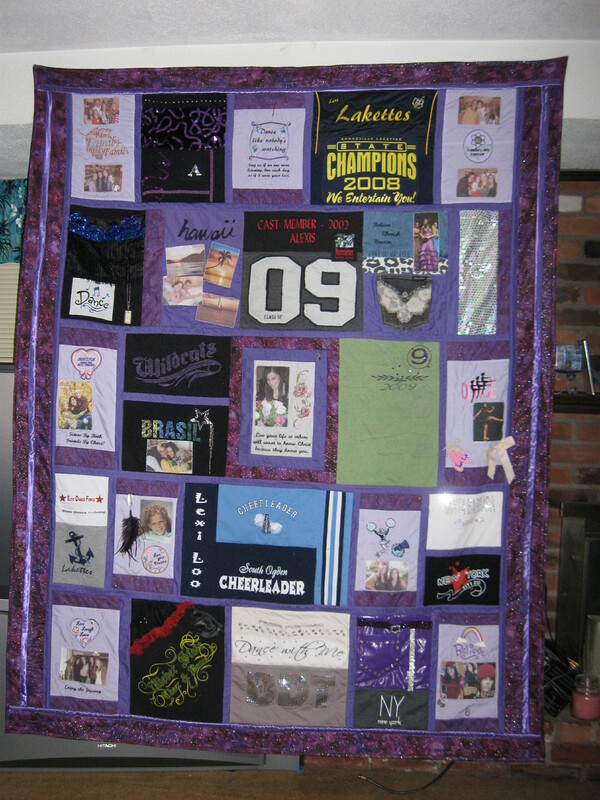 Photos and embroidered designs and/or wording may also be added. Email Karen@cofq.net with any questions or for a quote. 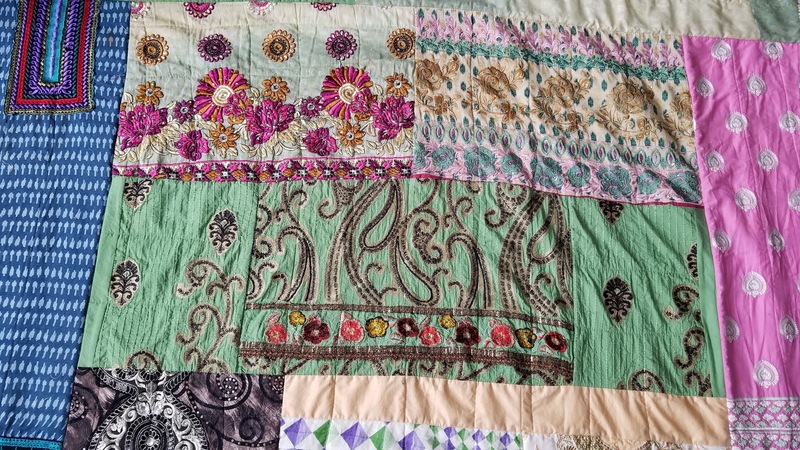 This Quilt 64 x 93"
Photos, Embroidered Designs and Wording added The Patchwork border brings in many different Fabrics to add color for a Fall feel! 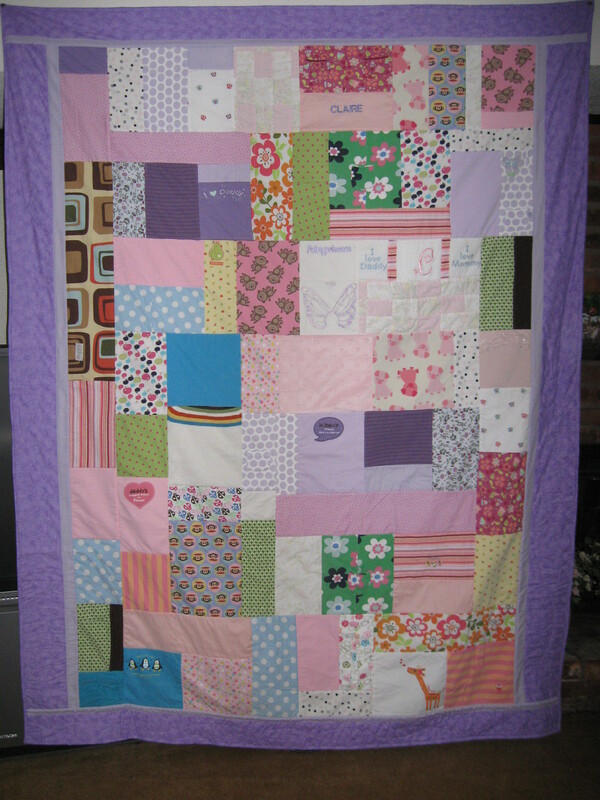 This Quilt 68 x 92"
This Quilt 73 x 102"
Backed with Fleece for a super soft and cozy Quilt! Photos may be added. 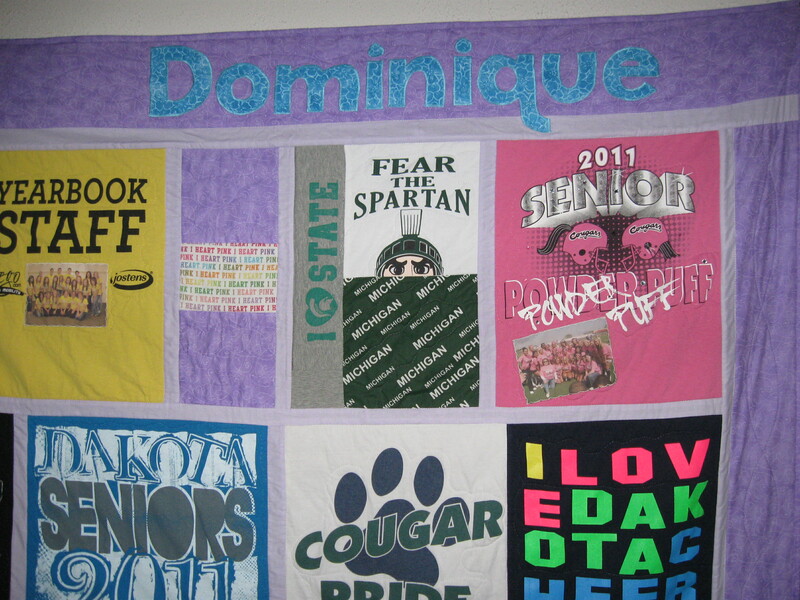 Quilt done in any size and color combination! 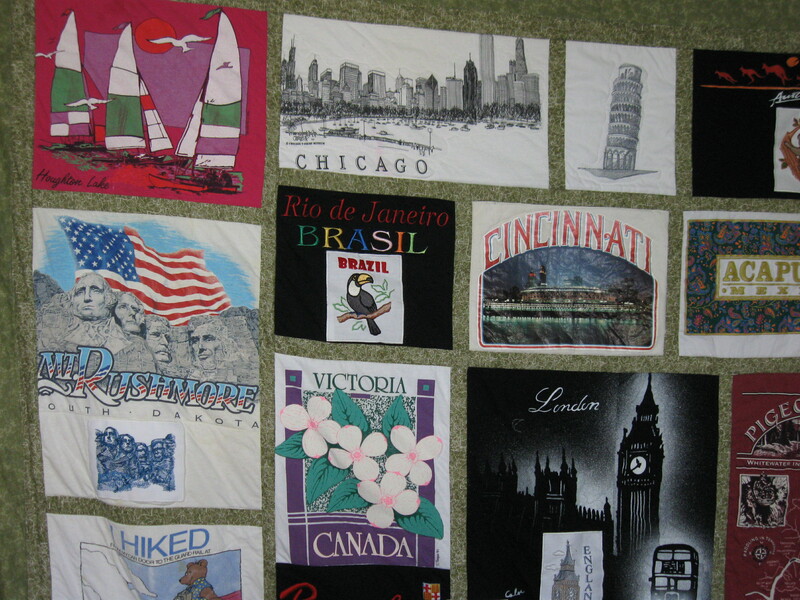 This Quilt 55 x 65"
Many fun and/or Theme Fabrics available Sweatshirt panel is actually a functioning pocket! 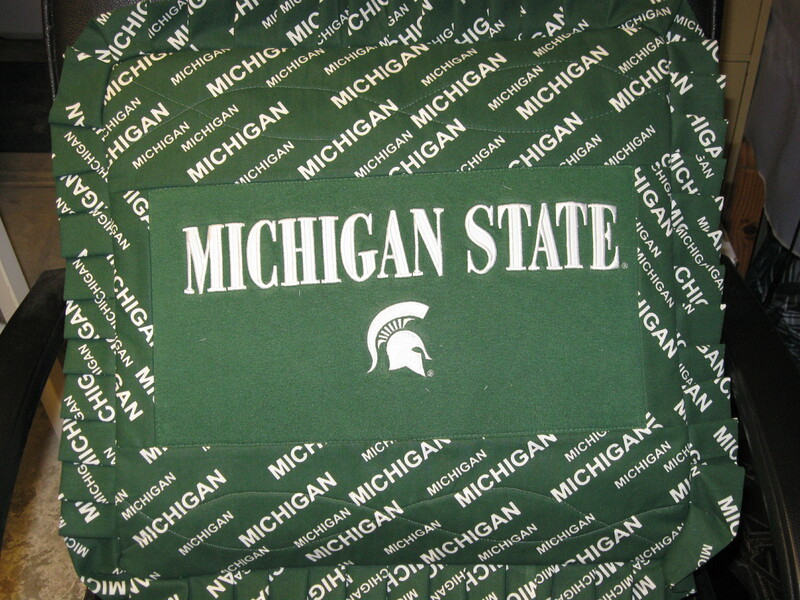 Don't want to discard old Ties? This is the perfect way to showcase them! 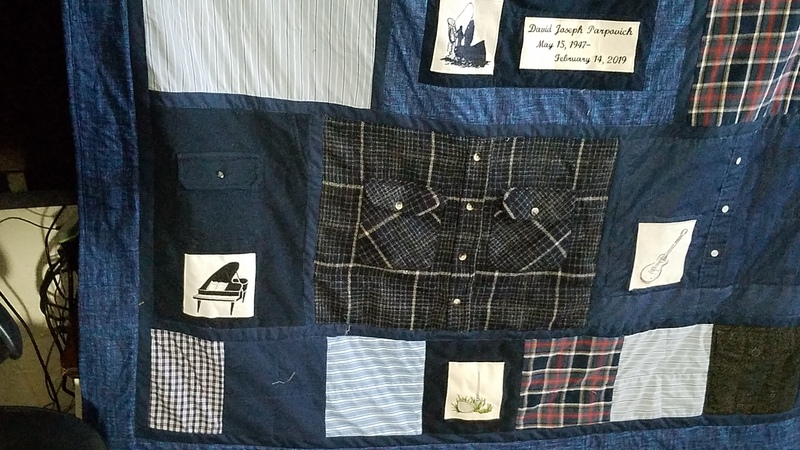 Almost 100 different Ties used in this Quilt! 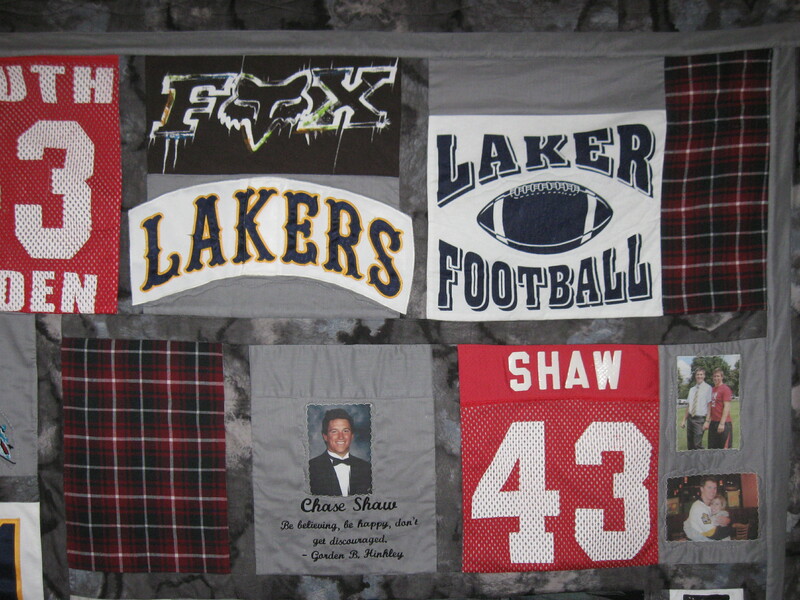 Photos and Embroidered Wording may also be added. 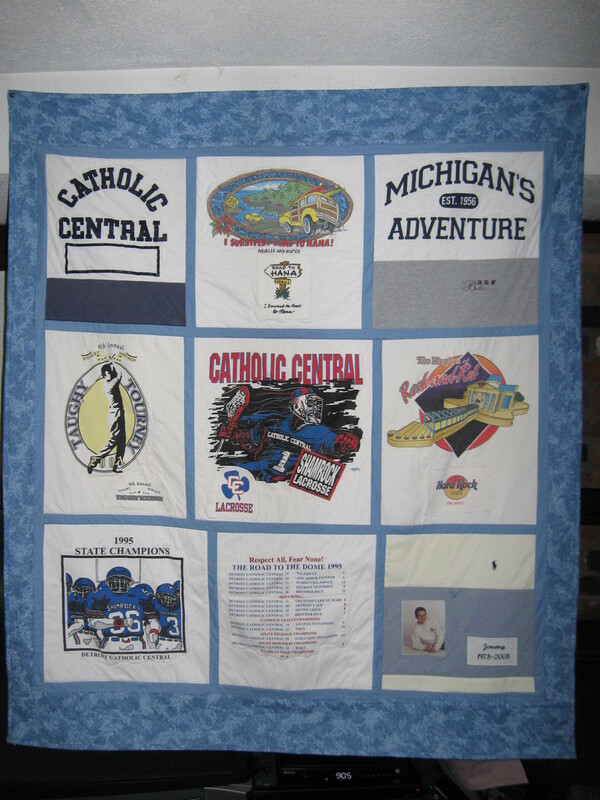 This Quilt 57 x 65"
Other Clothing Items may also be added to create a personalized Quilt! Embroidered Wording and Designs may be added. 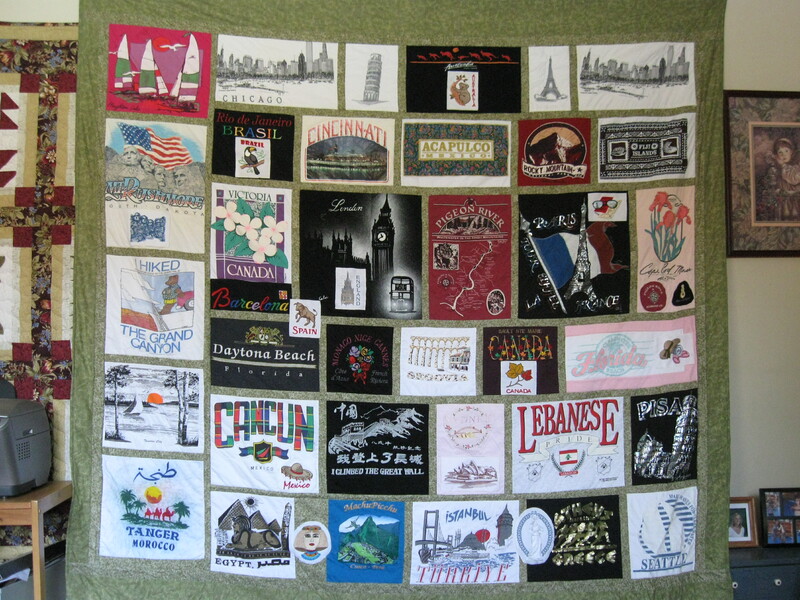 This Quilt 47 x 58"
Beautiful Embroidery Designs available in almost any theme! 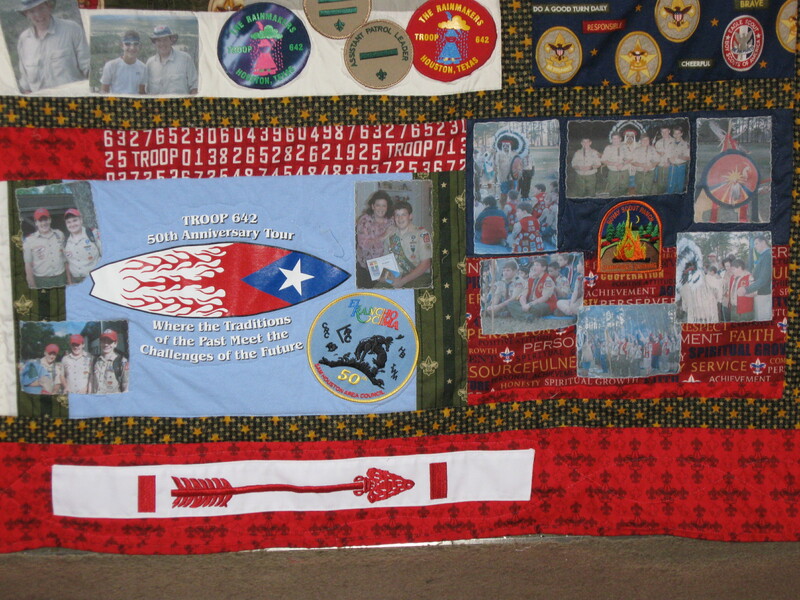 Tie pieces create a personal and unique border. 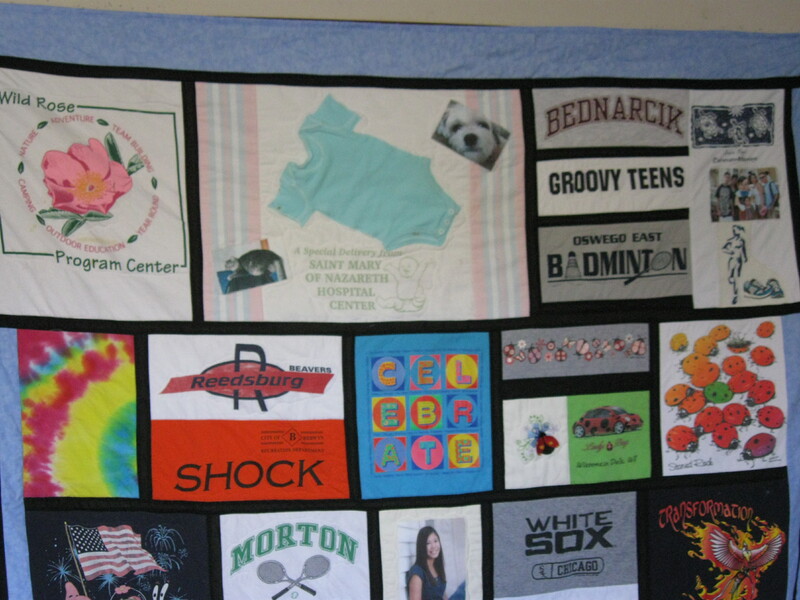 To view more Quilts with Clothing items added, click Here. 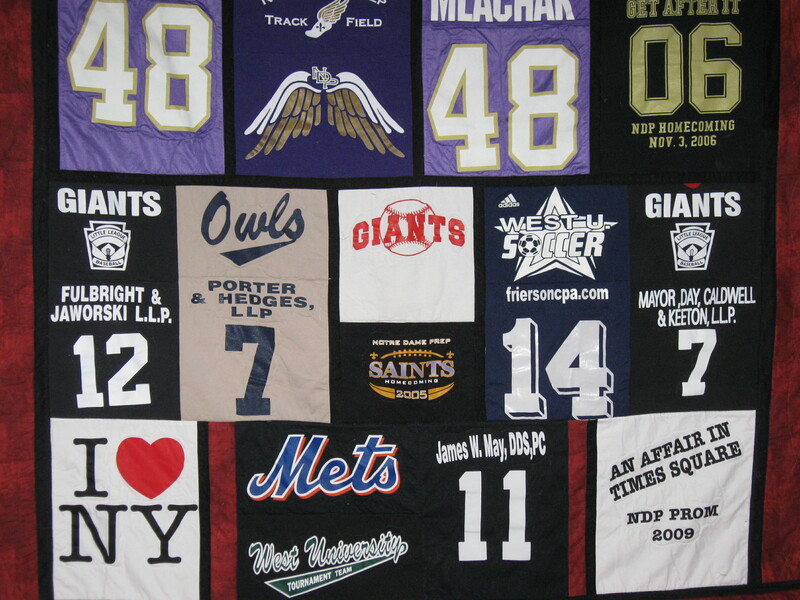 This Quilt 75 x 98"
T-shirt collection at a glance! 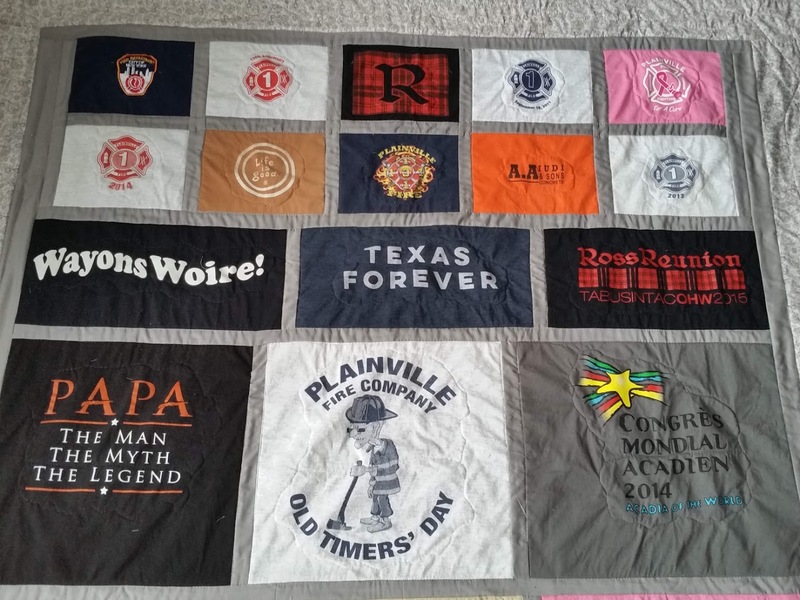 36 T-shirts added for a large Quilt! 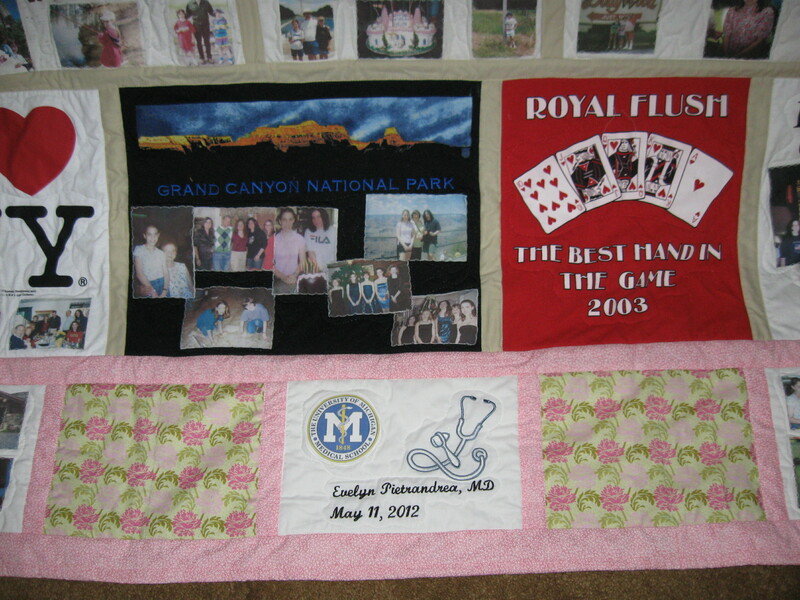 Photos and Embroidered Design create a truly personalized Quilt! 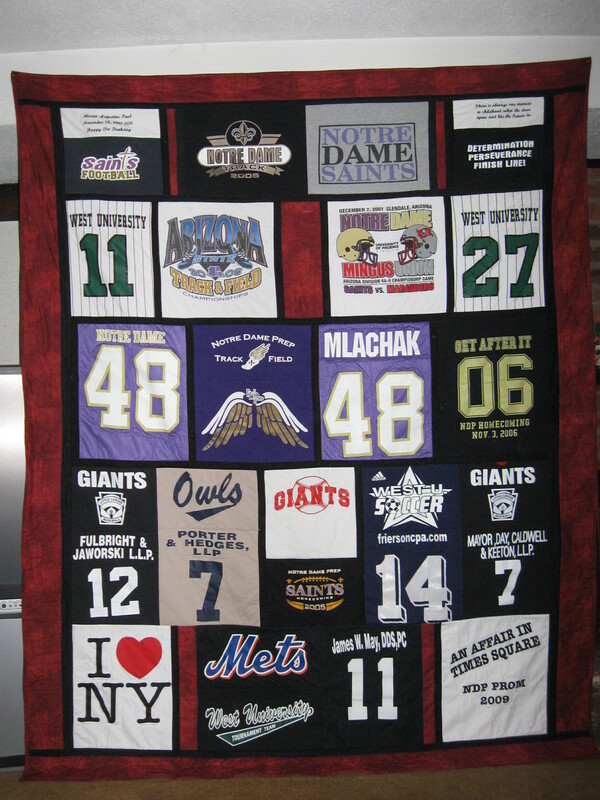 The top row contains logos/designs from Baseball Caps! Photos may also be added. 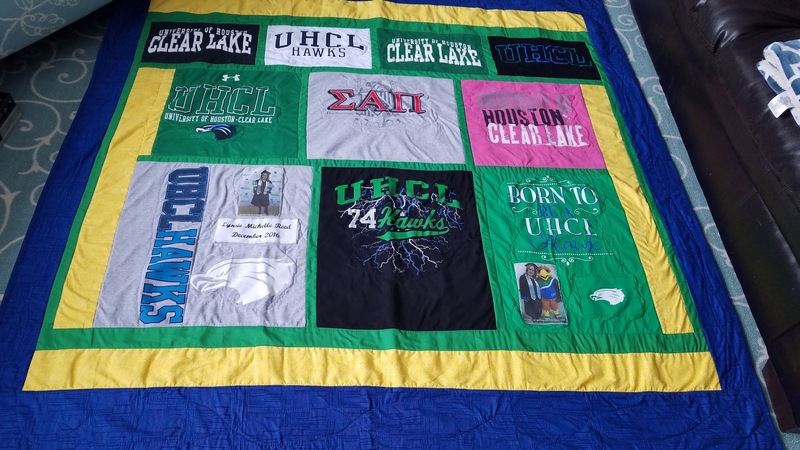 Quilt done in any size and color combination! 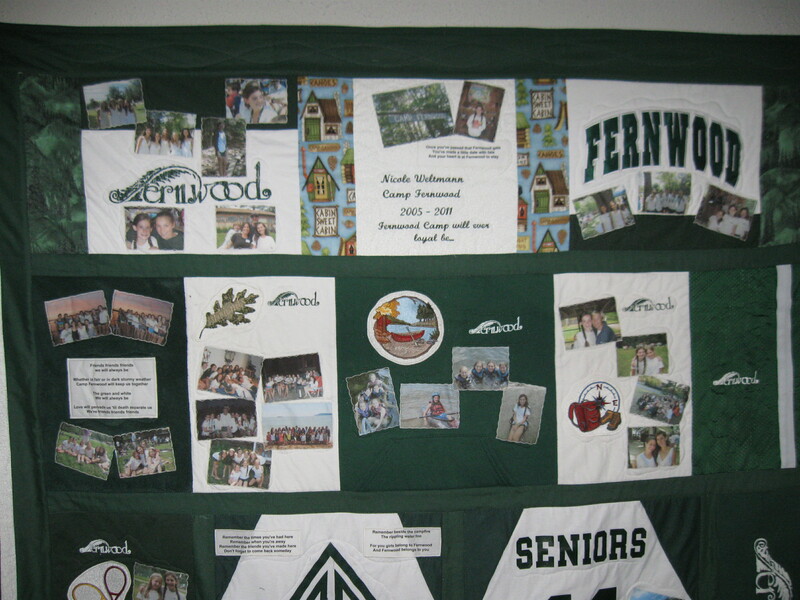 Done in any size and your choice of colors-a great way to present many memories at a glance! Done in your choice of colors, Photos may also be added! 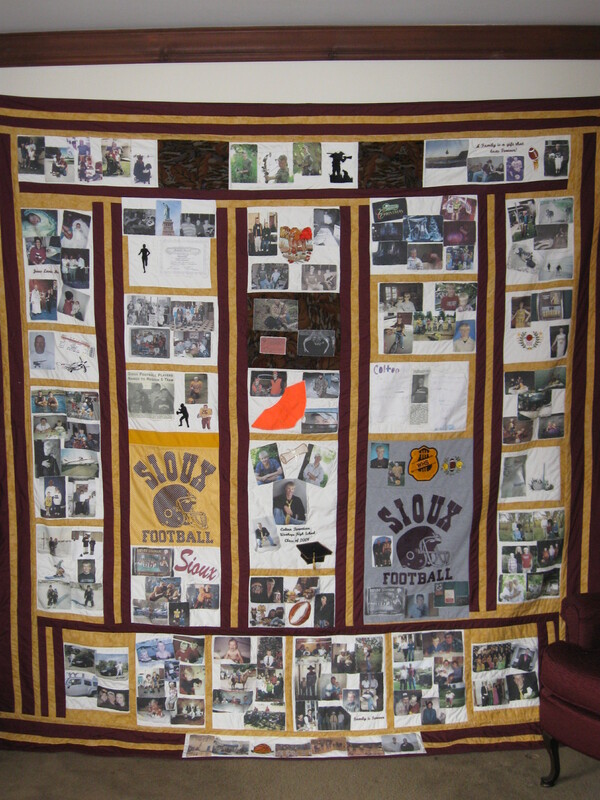 This Quilt 56 x 82"
Photos, Designs, Wording may also be added. 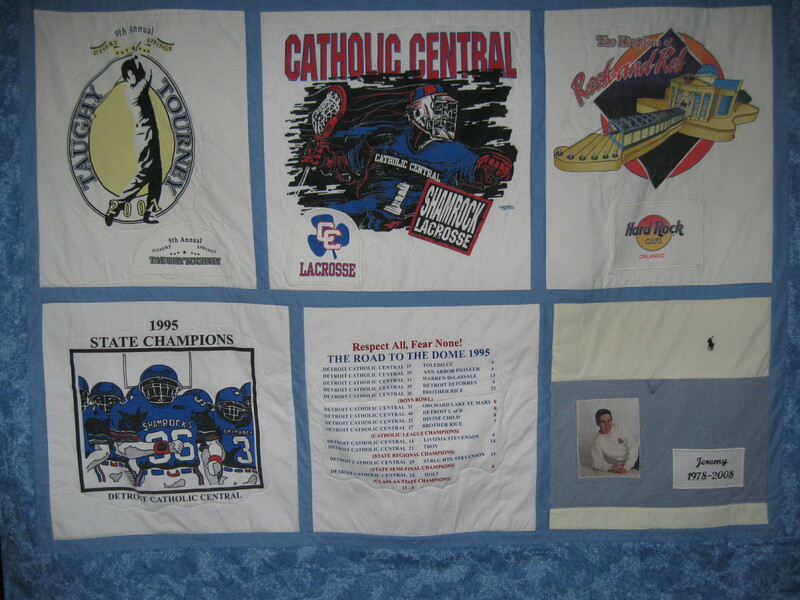 Center using a T-shirt panel with 'clothing' squares surrounding. 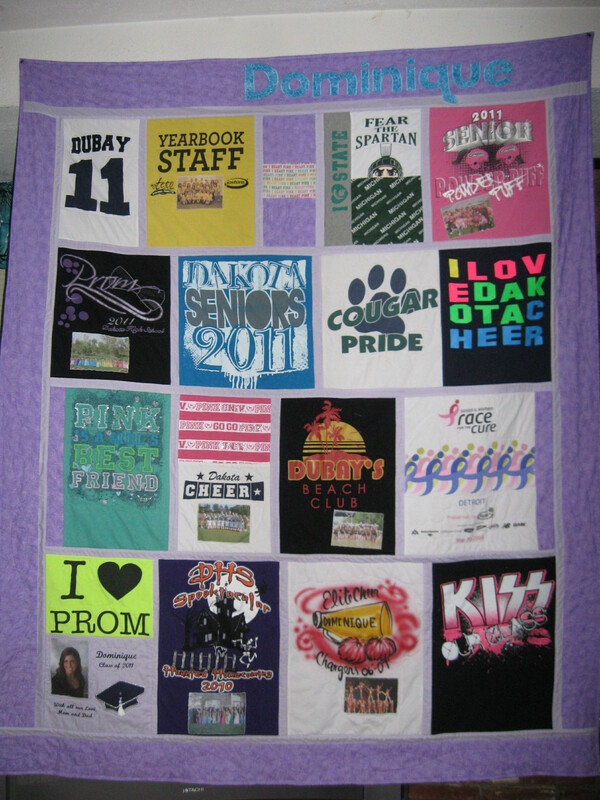 Done in your choice of colors and in any size! 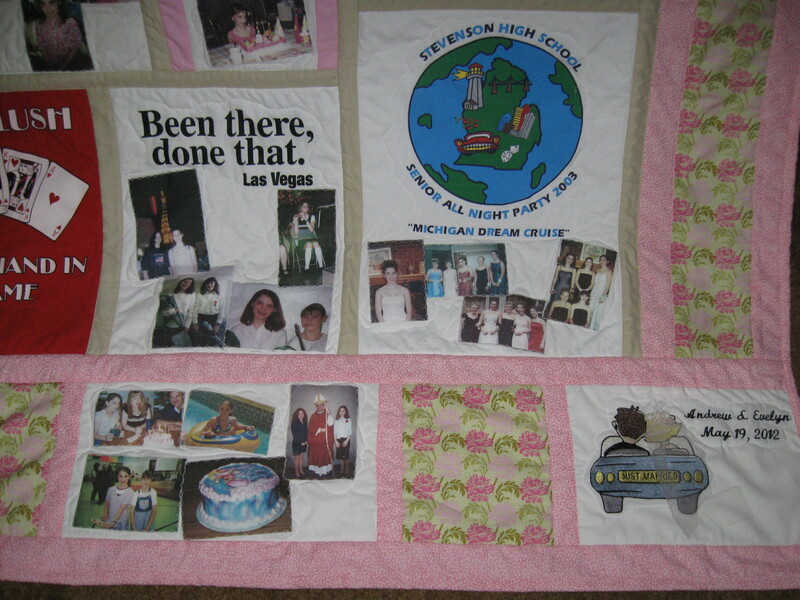 Photos and Embroidered Wording added. 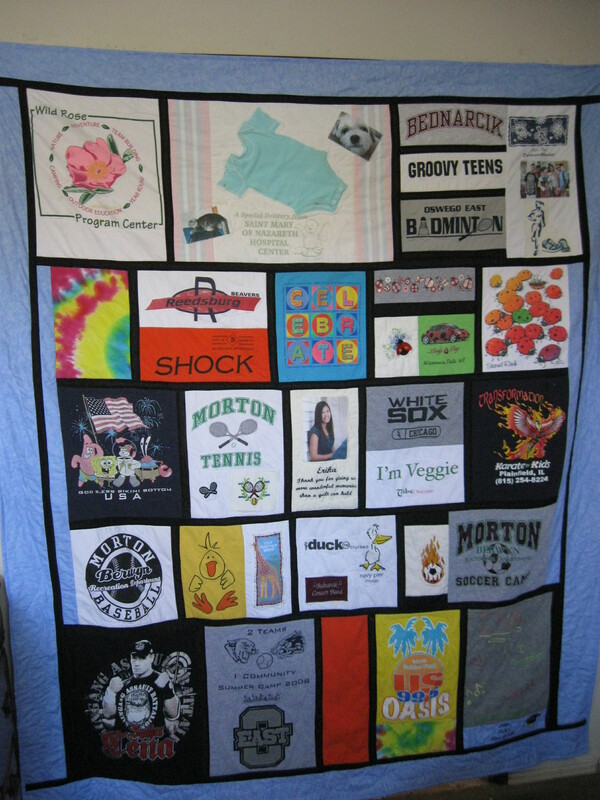 Designs available in any theme! 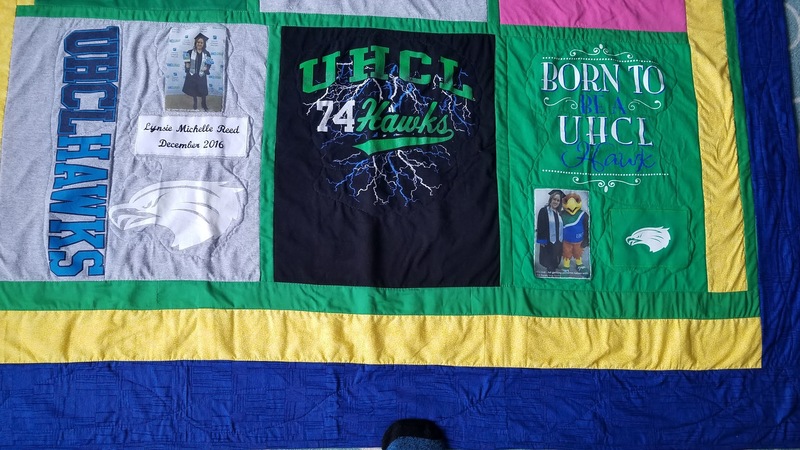 This Quilt 76 x 94"
Due to the extremely large size, Fleece fabric as a backing is the only option and there may be a shipping charge added. 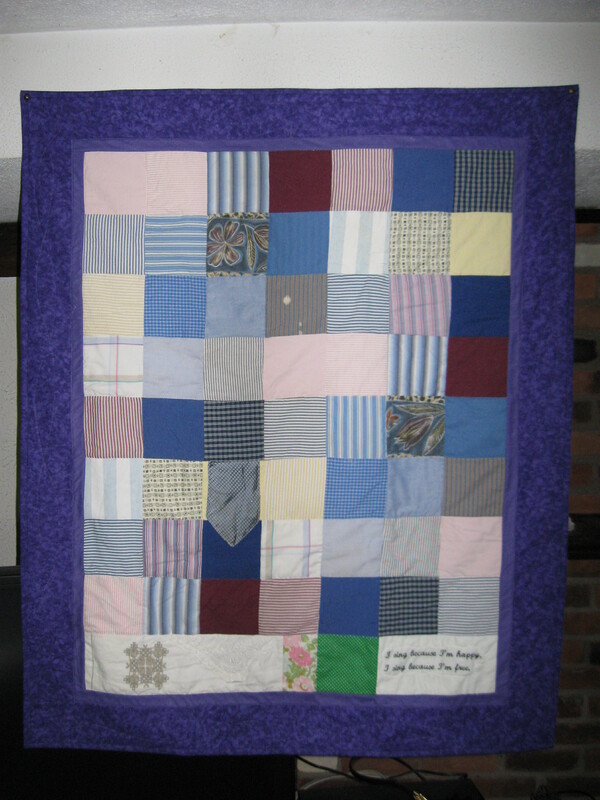 This Quilt 87 x 108"
Almost any type of garment may be added, just ask! 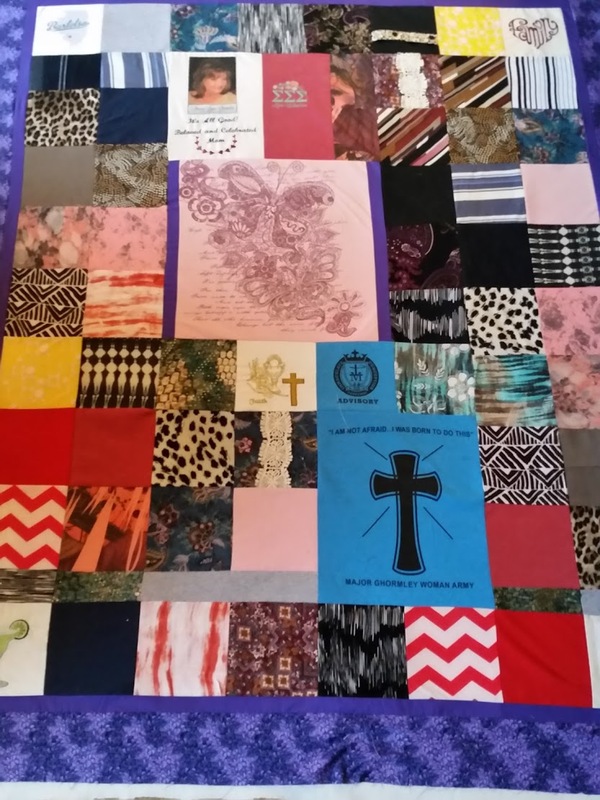 This Quilt 60 x 81"
Done in your choice of Colors and Fabric Style! 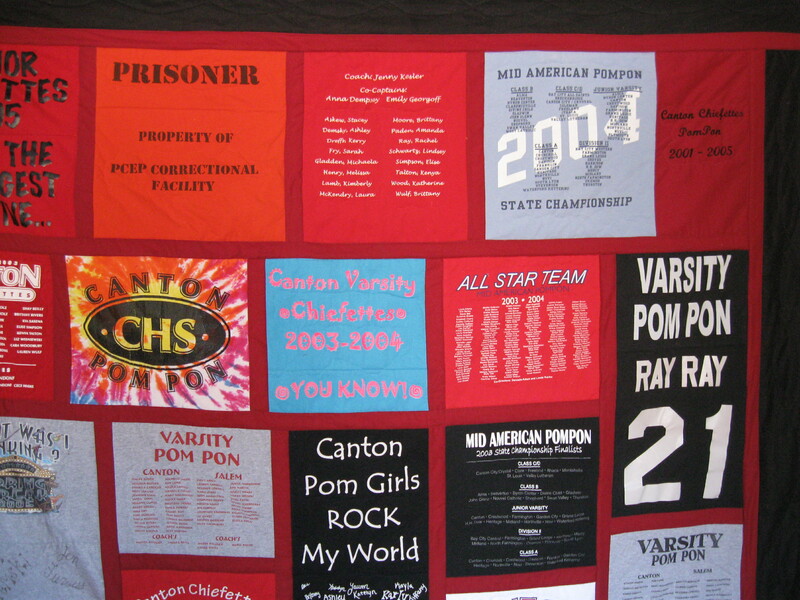 Wording, Photos and Embroidered Designs added- included in the cost! 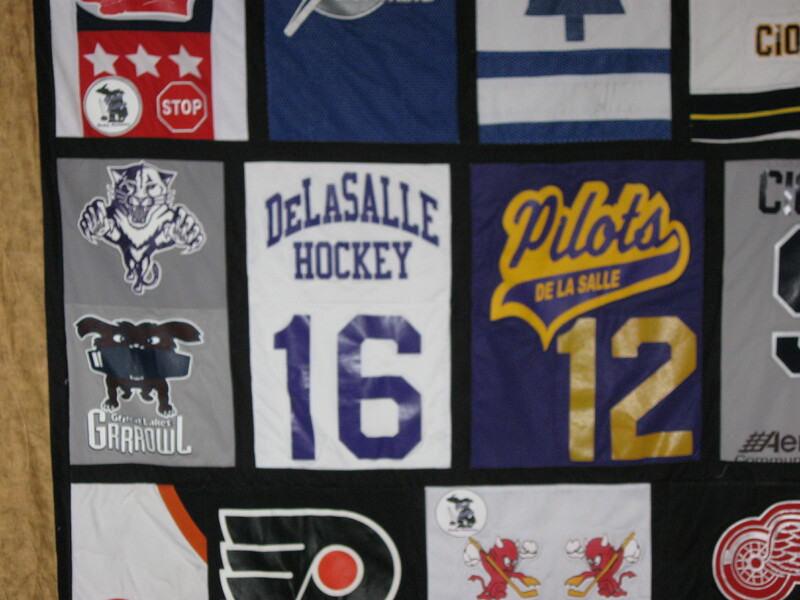 This Quilt 53 x 64"
Student name and Team name appliquéd on the Quilt borders! Almost any type of garment and/or clothing item may be added, just ask! 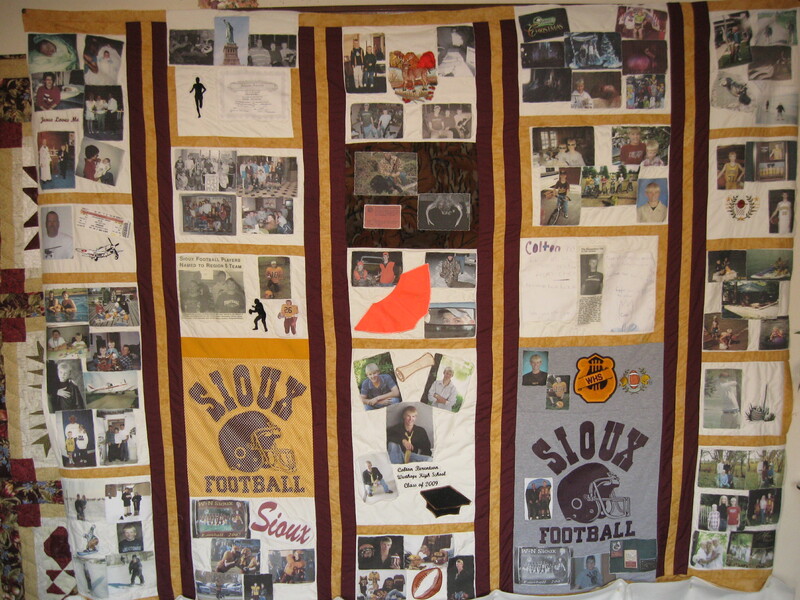 This Quilt 72 x 88"
Great way to capture favorite High School Memories! 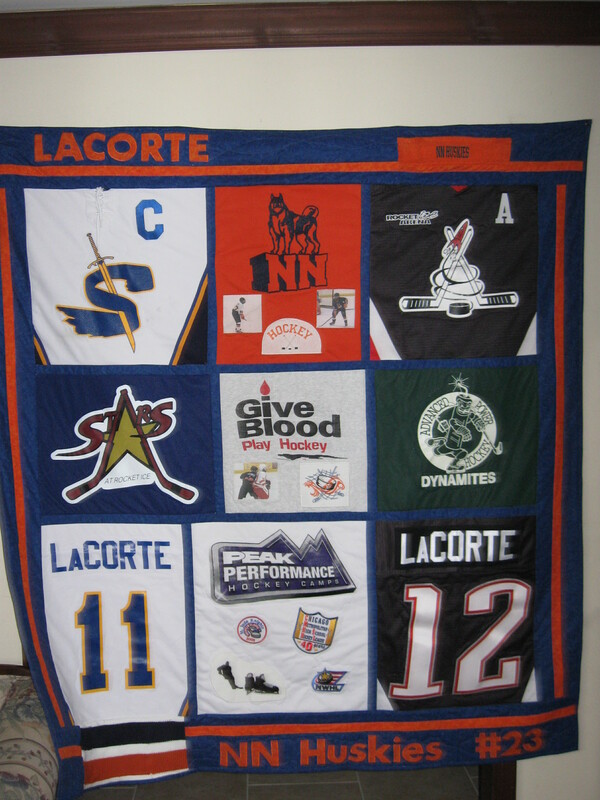 Embroidered Designs available for almost any Sports, Hobby, Favorite Thing! 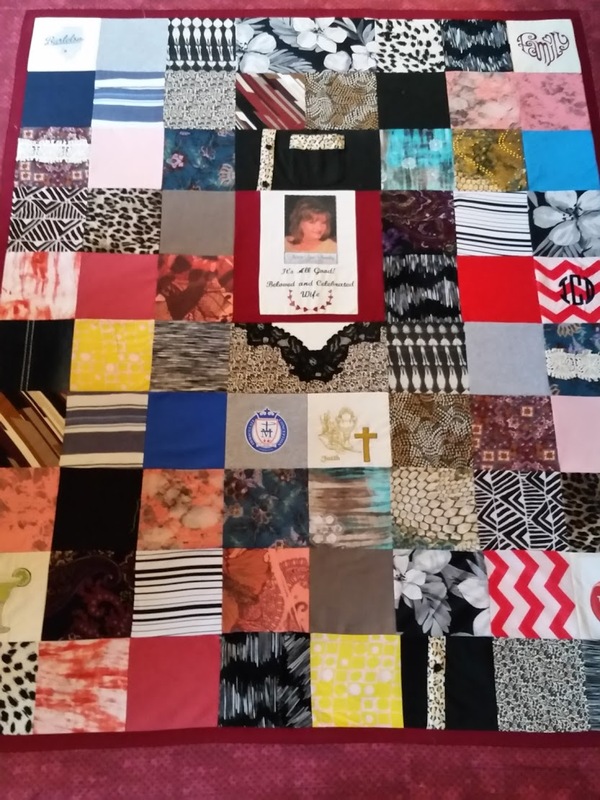 This Quilt 66 x 88"
Fabrics available in any Color and Style! The Black garment shown above is actually a zip up jacket turned into a zip up pocket! 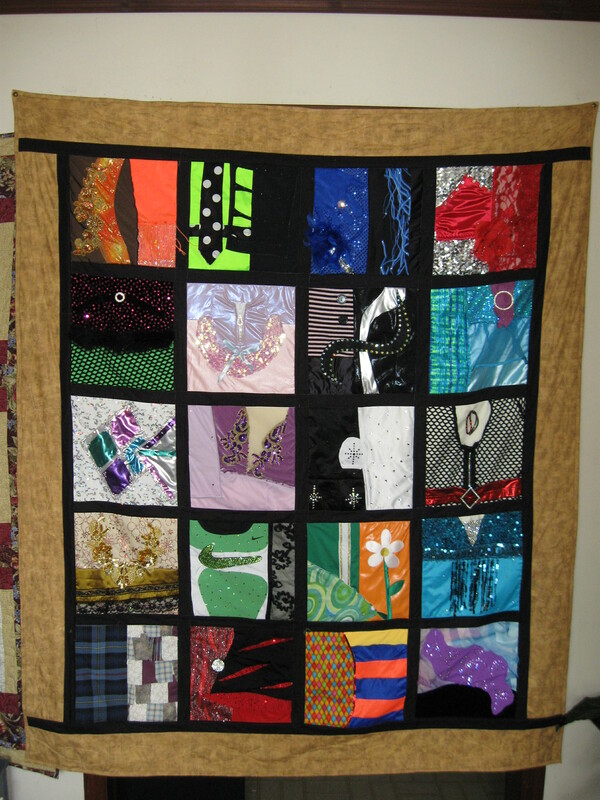 This Quilt 74 x 80"
Quilt can be done in your choice of colors and fabric style! 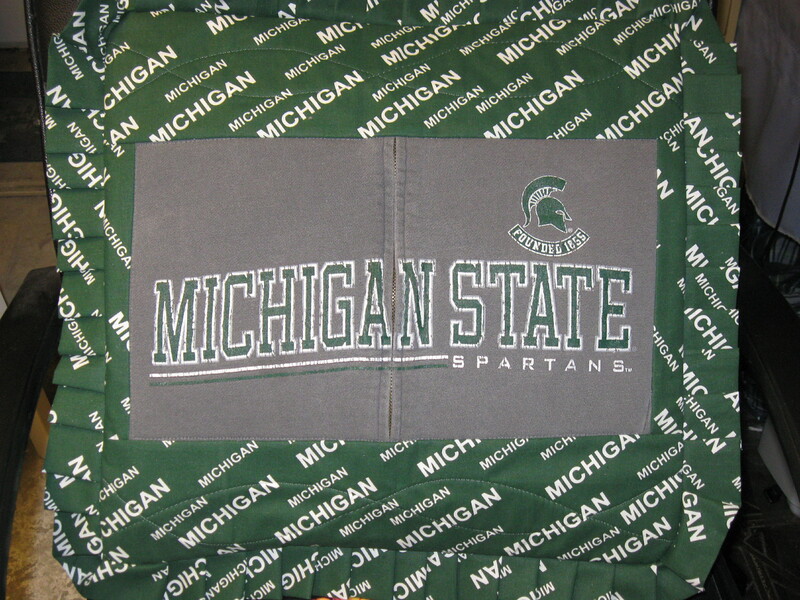 Backed in a wonderful Fleece fabric for extra warmth and comfort! 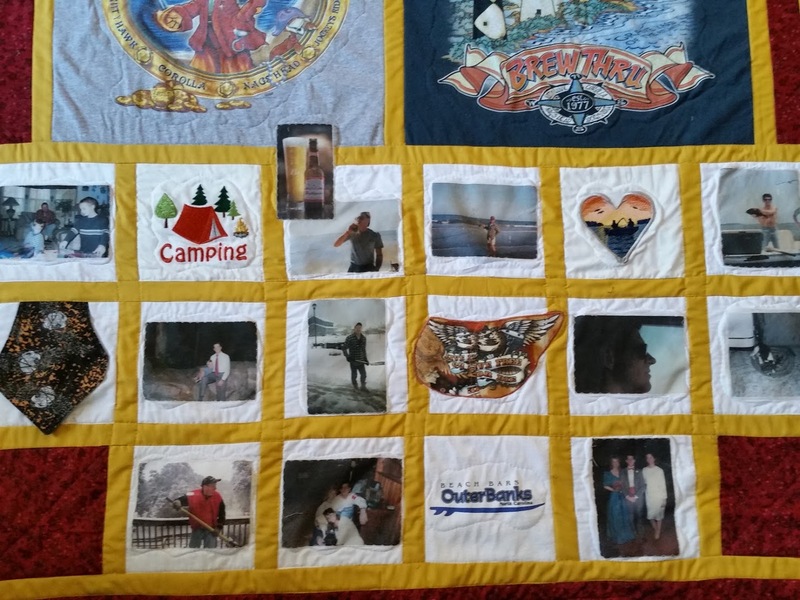 This Quilt 82 x 103"
Photos may be added along with almost anything that can be copied! 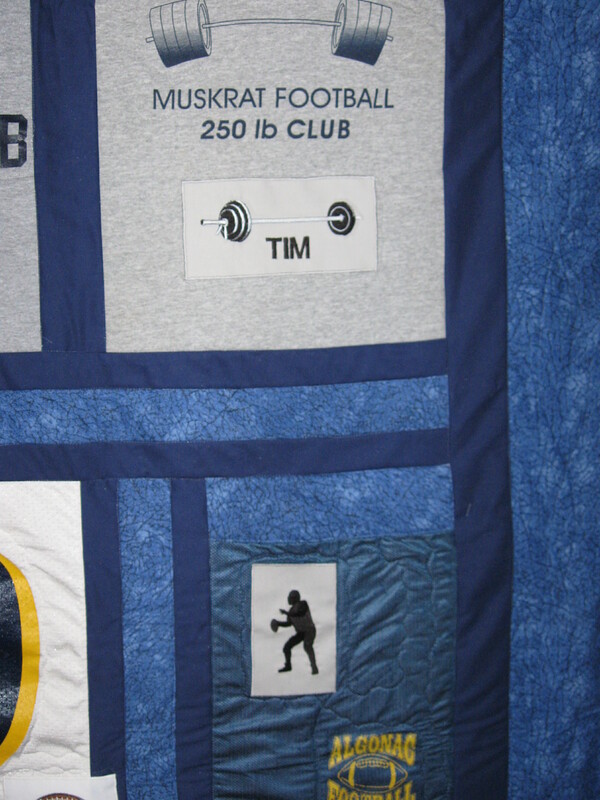 Embroidered Wording and Designs added for an extra personal touch! 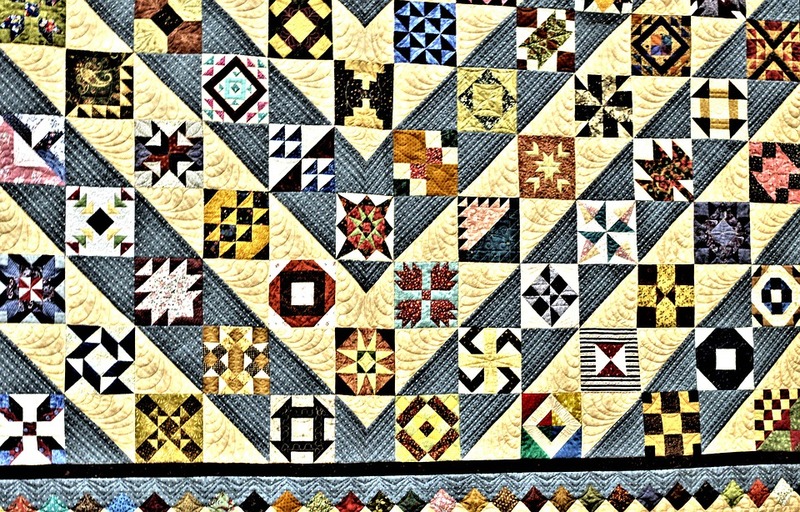 This Quilt 82 x 120"
Great theme fabrics used whenever available. 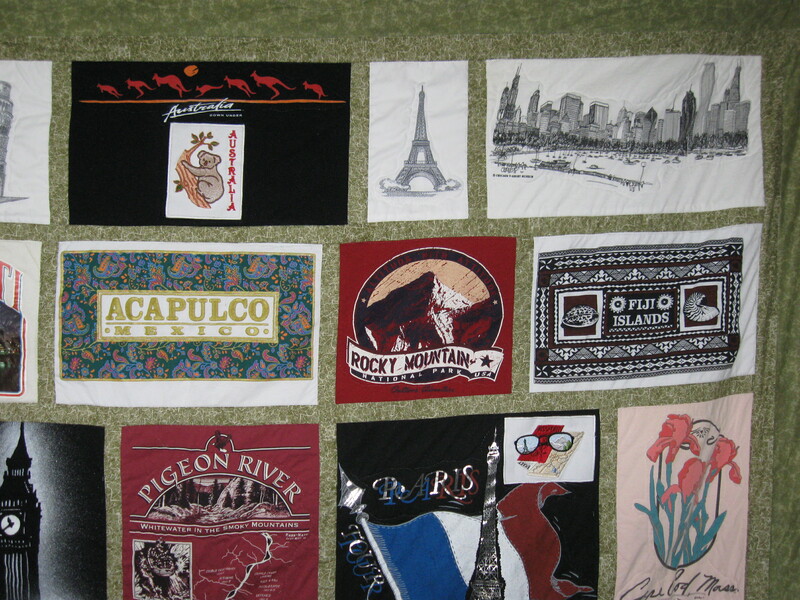 Embroidered designs for most themes available! 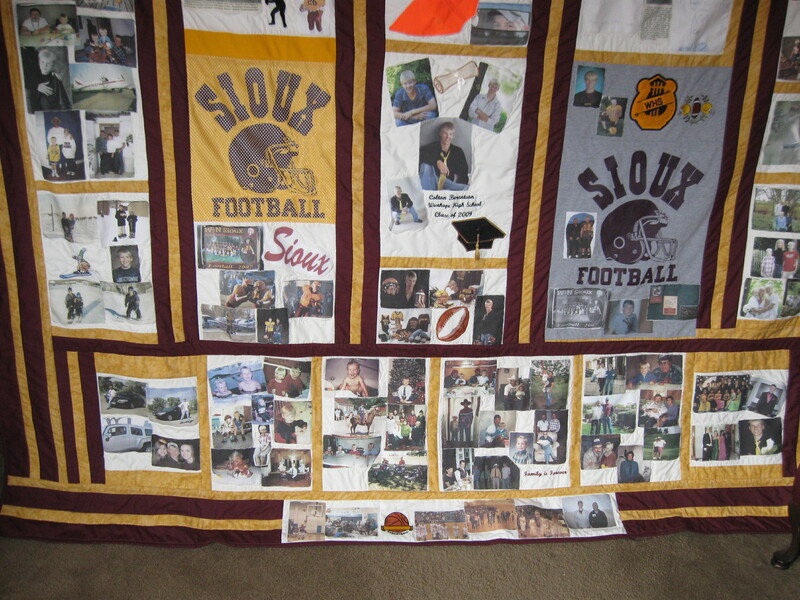 Wording and Photos may also be added! 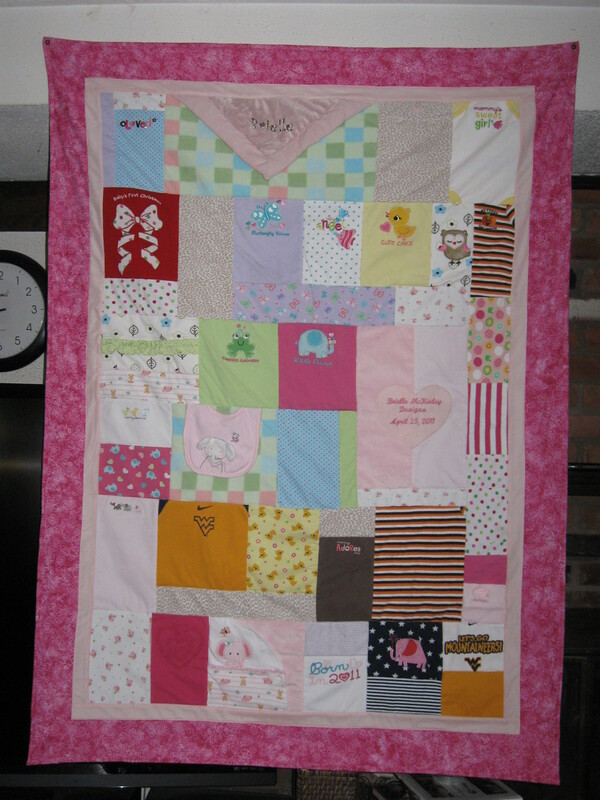 This Quilt 45 x 60"
Most clothing items can be added and Quilt done in any size and your color choice! 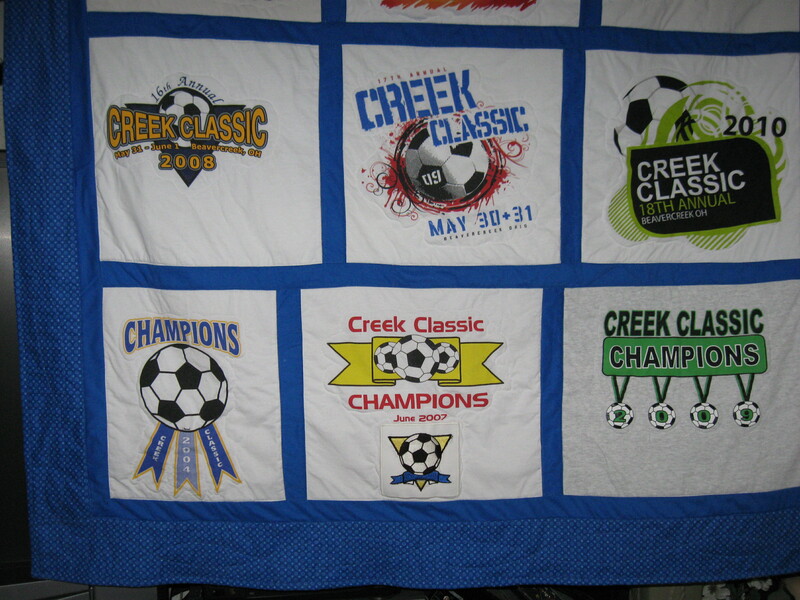 Many great theme related Embroidery Designs available-just ask! 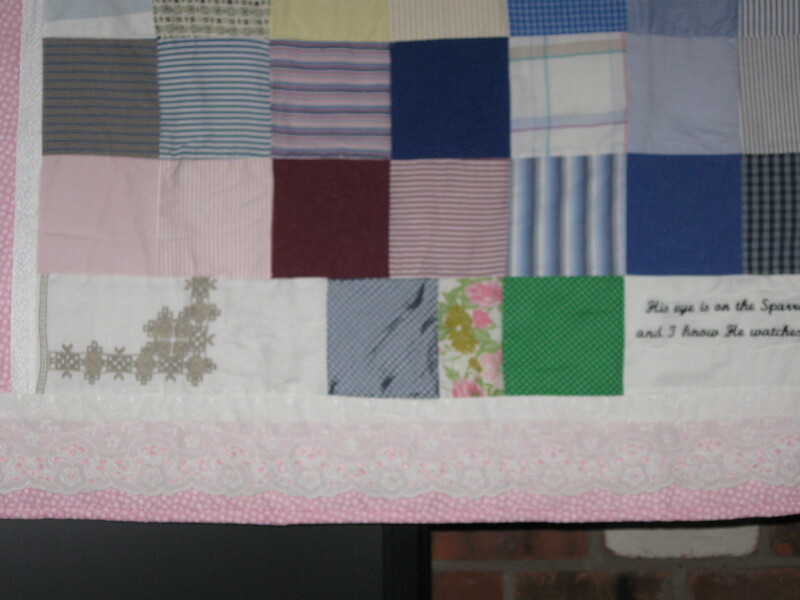 This Quilt 66 x 90"
Several sections left open- perfect for Friends and Family to write messages! 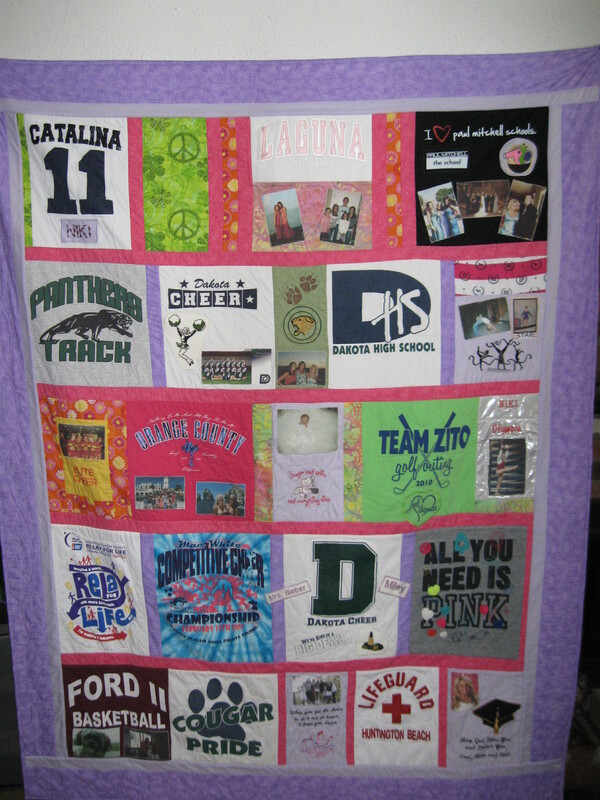 This Quilt 45 x 58"
Can be done in the school colors, add as many T-shirts as you like! 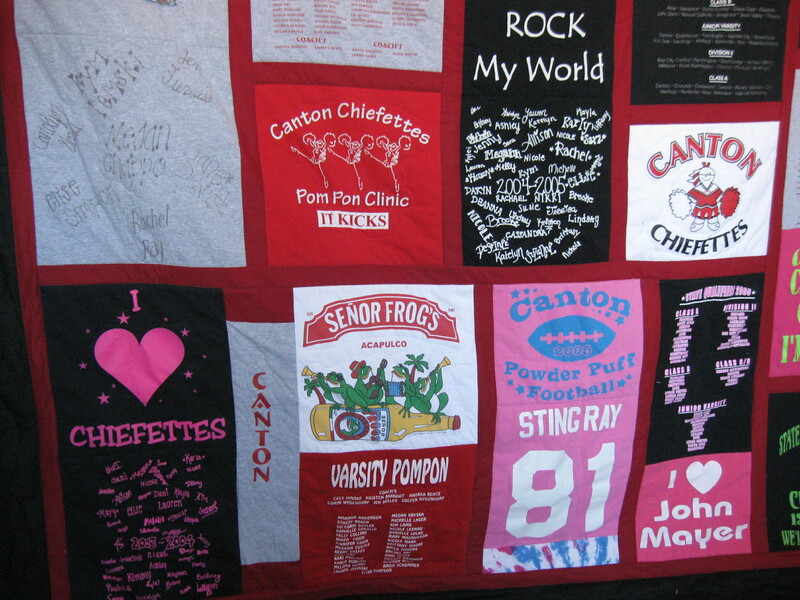 Many great theme related Embroidery Designs available-just ask! 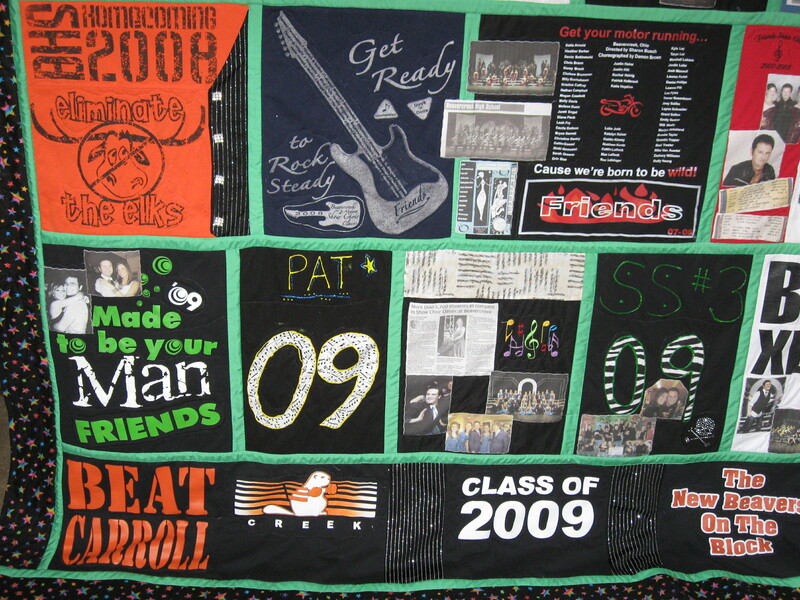 T-Shirt Graduation Quilt with Pocket! 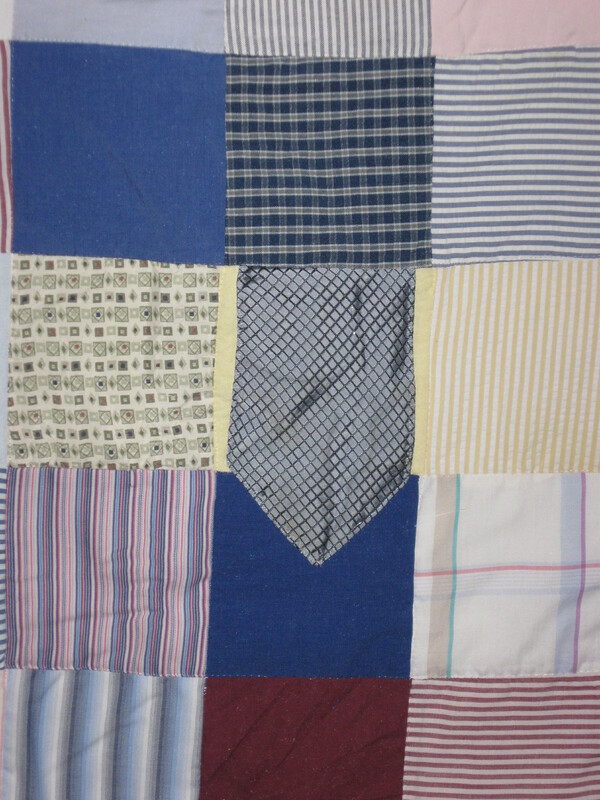 This Quilt 70 x 96"
Garment block created to be a pocket when unzipped! 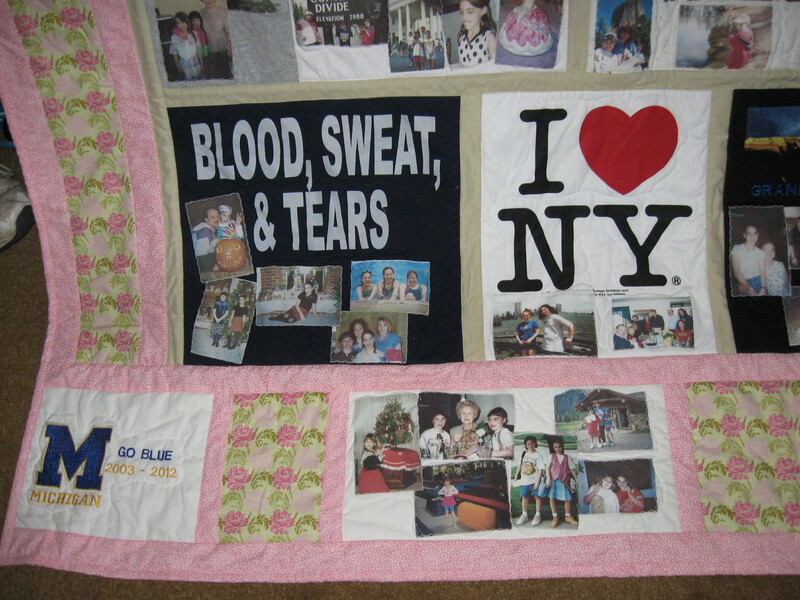 This Quilt 73 x 86"
Embroidered Wording, Designs and as many Photos as you like may be added. Even button-down garments may be added! 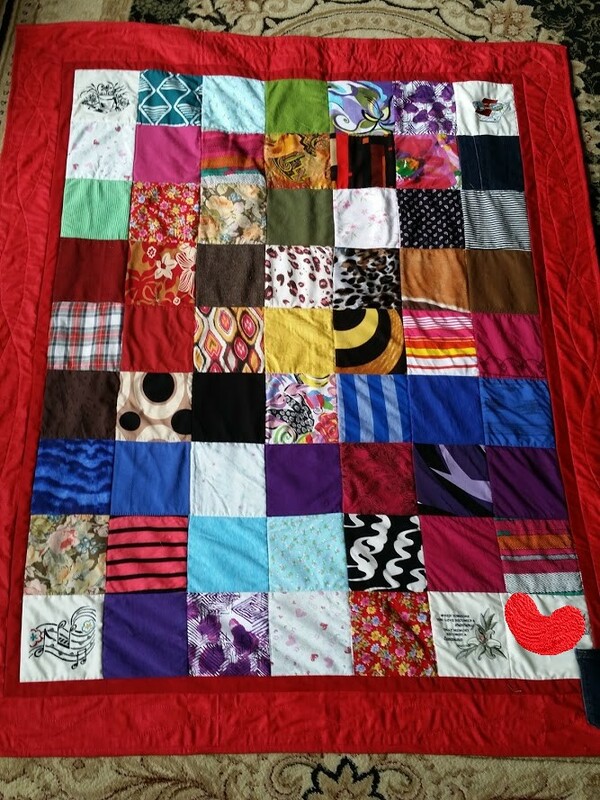 This Quilt 64 x 84"
Quilts done in any size and Color combination- backed with Fleece making Quilt super soft and warm- perfect to cuddle up in! 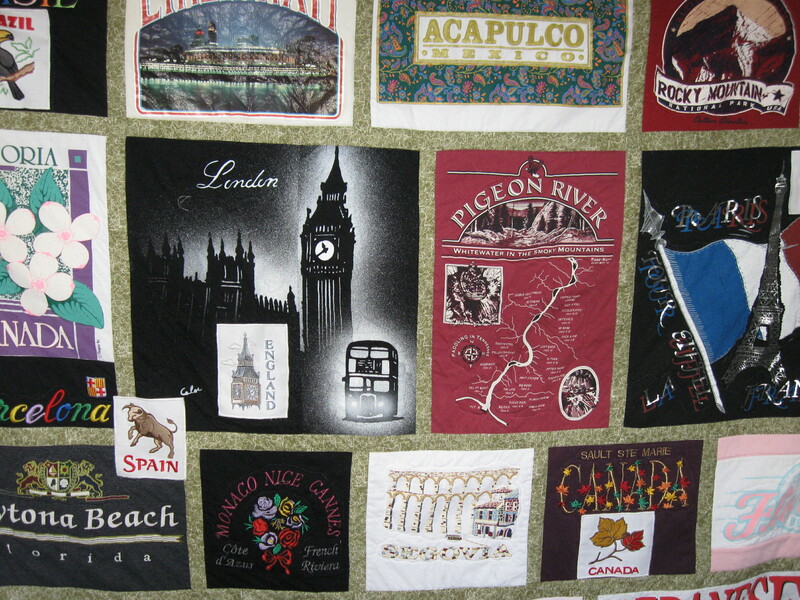 Many theme Fabrics and Embroidered Designs available-just ask! 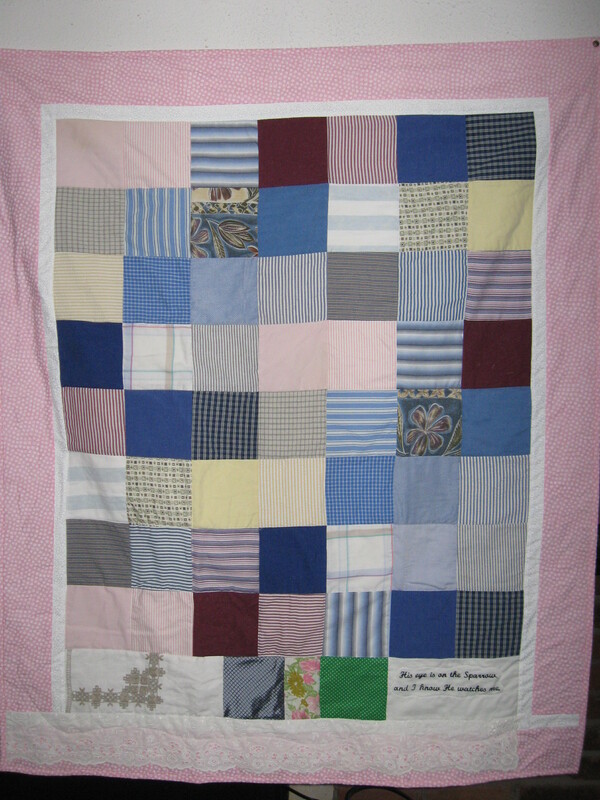 This Quilt 67 x 81"
This Quilt 54 x 64"
Embroidered Wording, Designs and/or Photos may also be added! 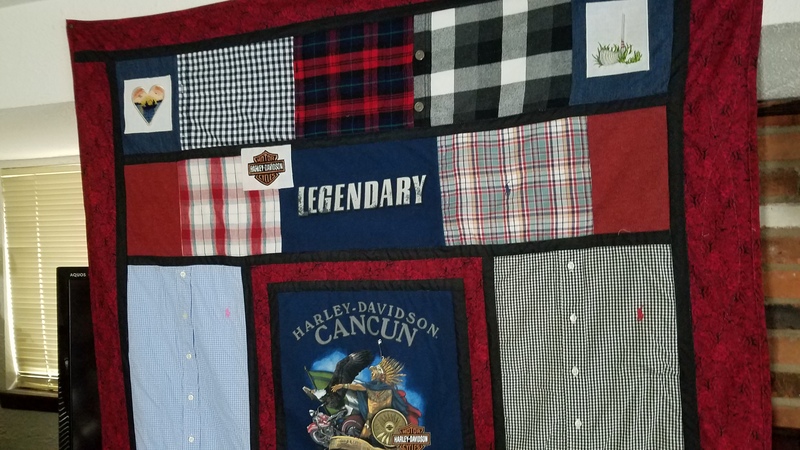 Done in your choice of Colors and Fabric Style. 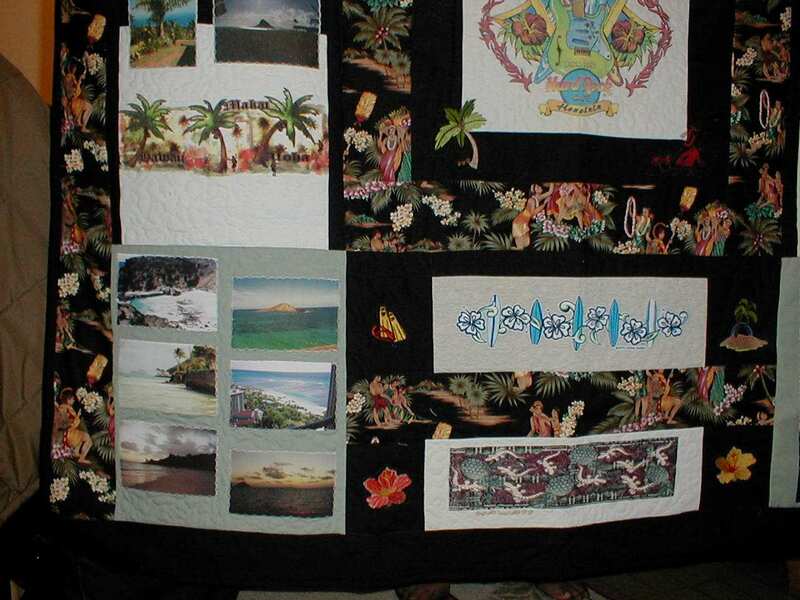 This Quilt 55 x 68"
Appliqued and Embroidered panel creates underwater look! 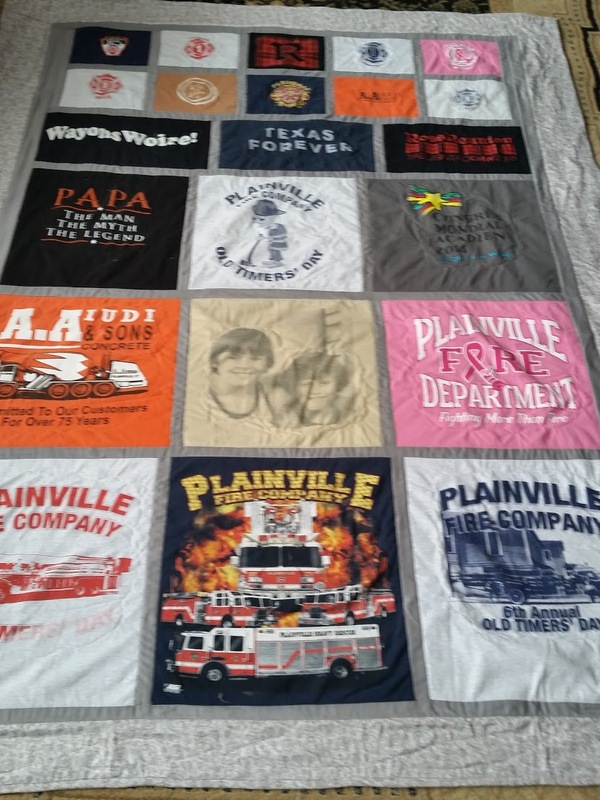 Designs in almost any theme available! 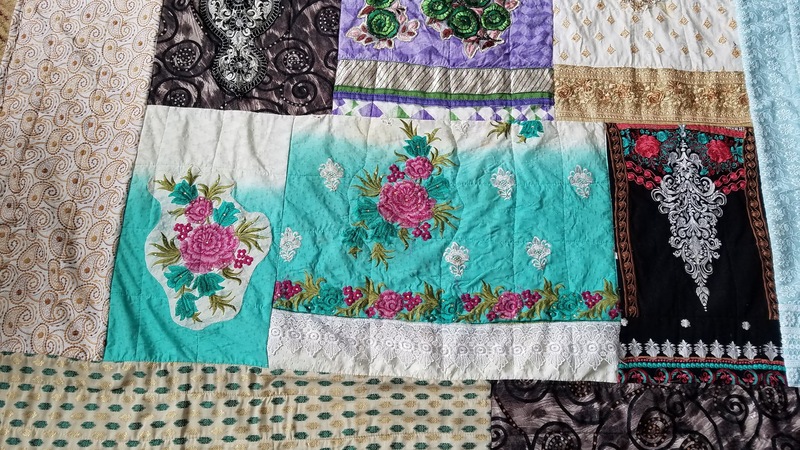 This Quilt 53 x 78"
This Quilt 58 x 75"
This Quilt 62 x 86"
Quilts are made in your choice of Colors and Fabric Style for borders. 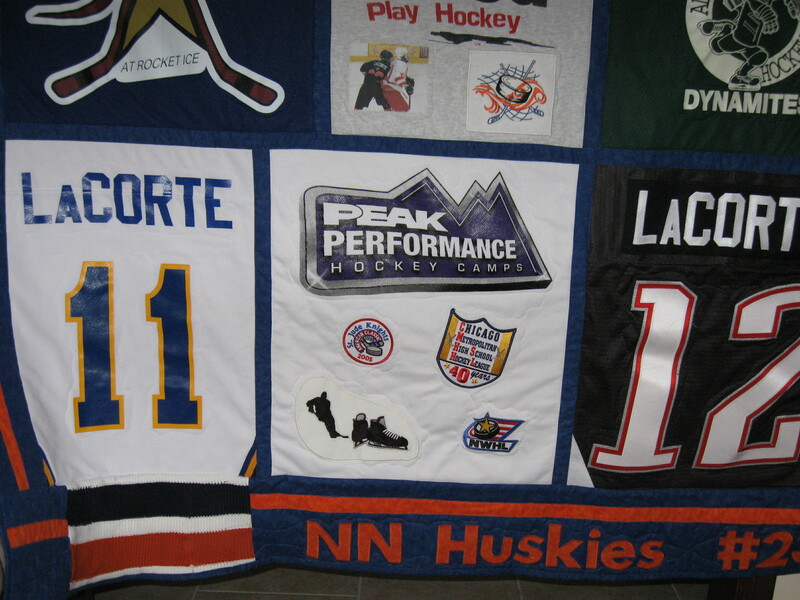 Embroidered Wording added. 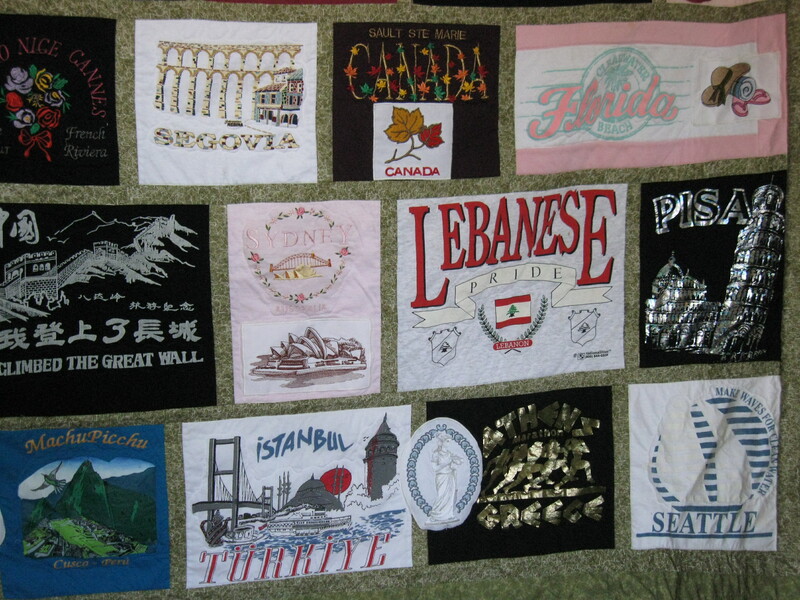 Many Embroidered Designs also available-just ask! 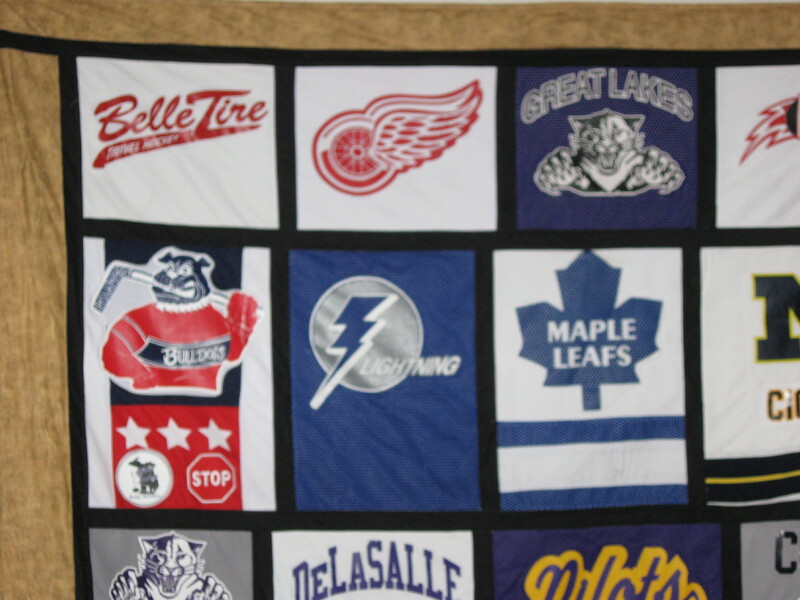 This Quilt 64 x 80"
Almost any 'theme' available for Embroidered Designs! 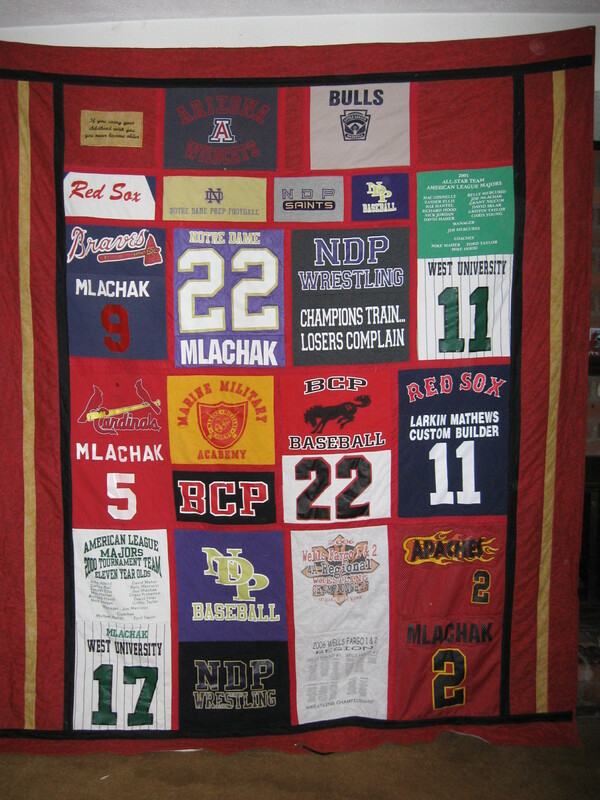 This Quilt 70 x 76"
Approx. $280. 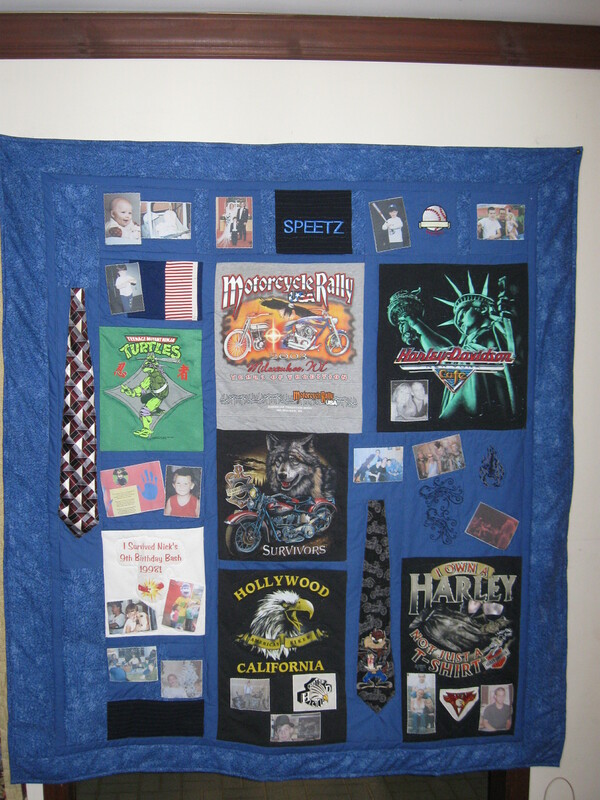 Photos, Embroidered Designs and Wording may also be added. A solid Black was used for panel borders, a muted Black print for outside border. 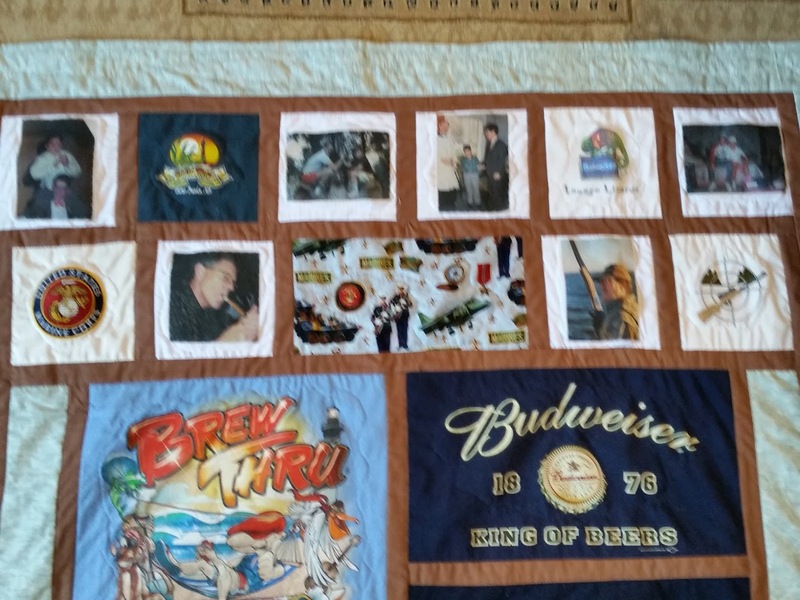 This Quilt 78 x 100"
Approx. $340. 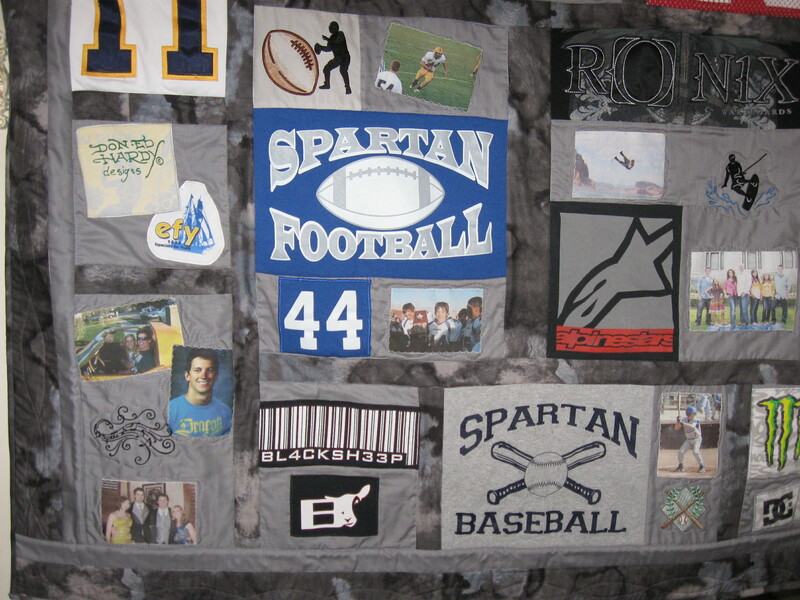 Almost anything can be added: Patches, Sports Letter, Articles, etc. 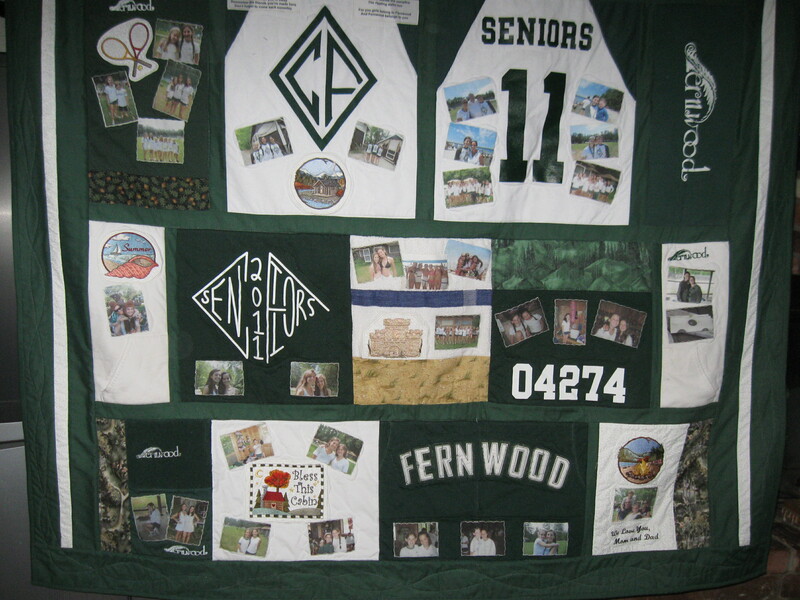 Photos, Embroidered Designs and Wording also added for a truly personalized Quilt! Approx. $320. 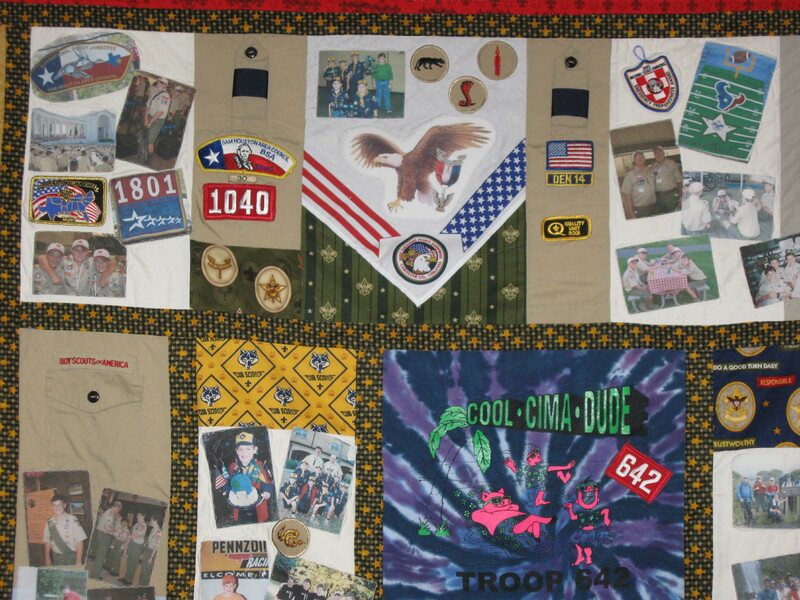 Outdoor and Camp Theme Fabric added-many Embroidered Theme Designs available! Actual beads added for a dimensional look! 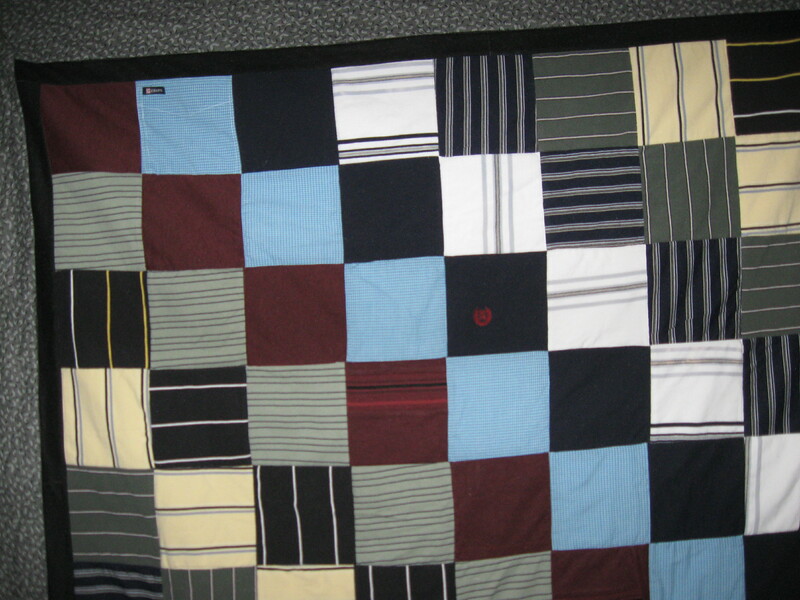 This Quilt 71 x 90"
Fleece backed for a super soft and warm Quilt! 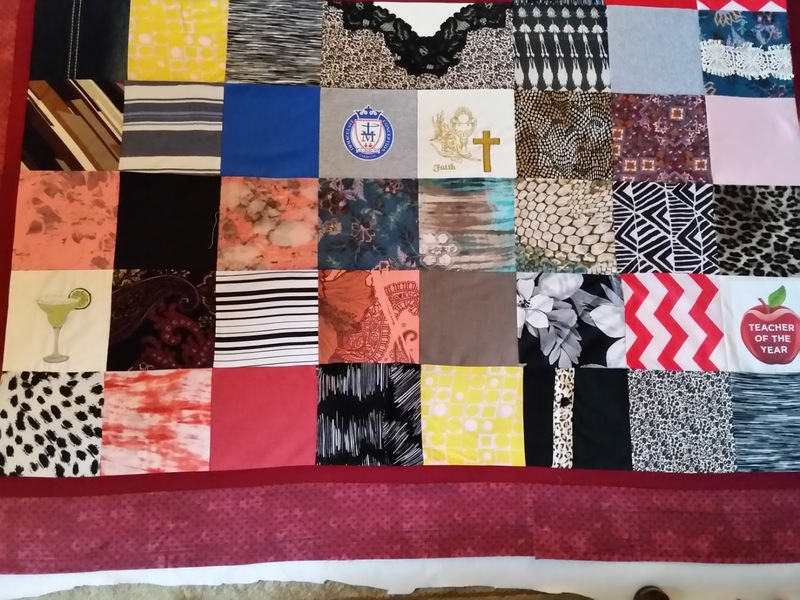 This Quilt 55 x 63"
Approx. $230. 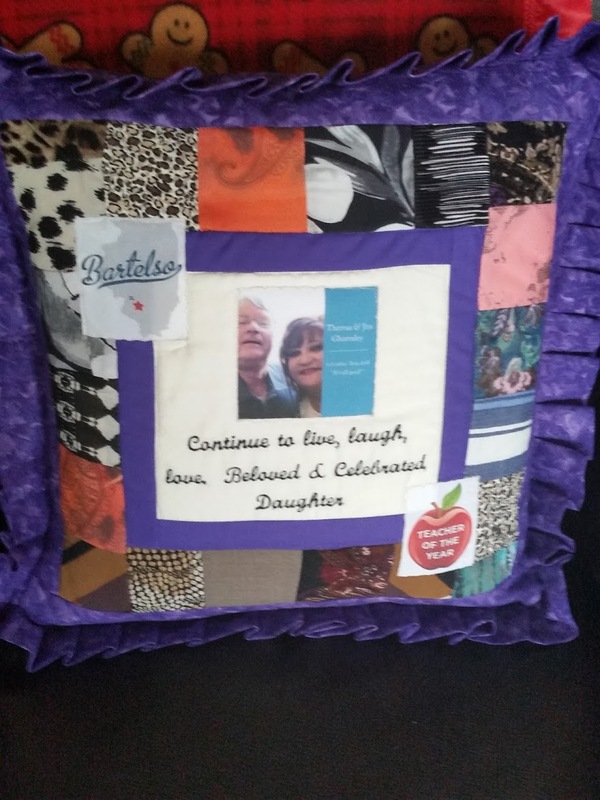 Embroidered Wording added-Designs in almost any theme available-just ask! 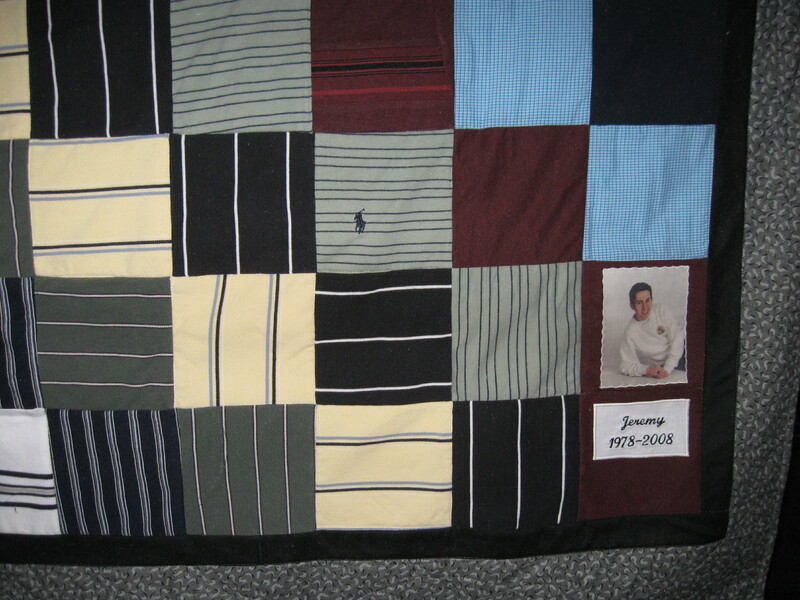 This Quilt 75 x 86"
This Quilt 65 x 80"
Approx. $300. 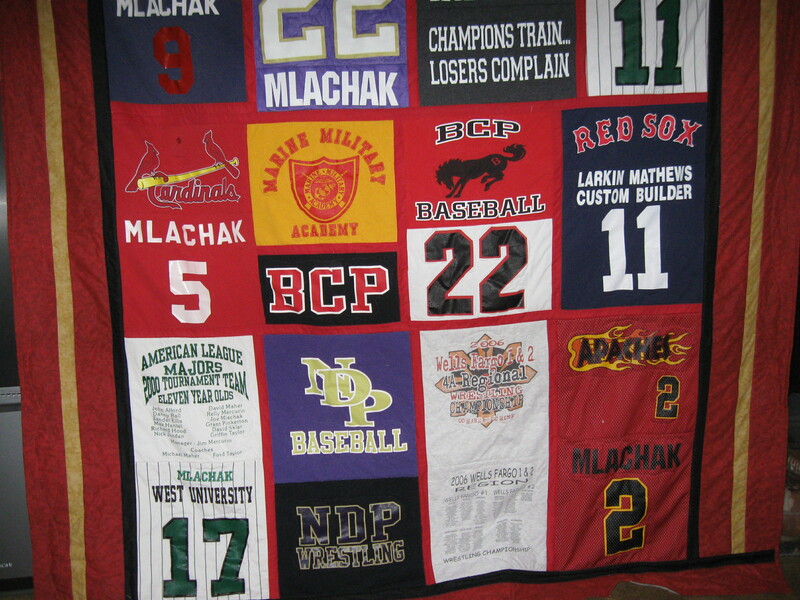 Made in your choice of Colors, Fabric Style and with any number of Tee's/Clothing items! 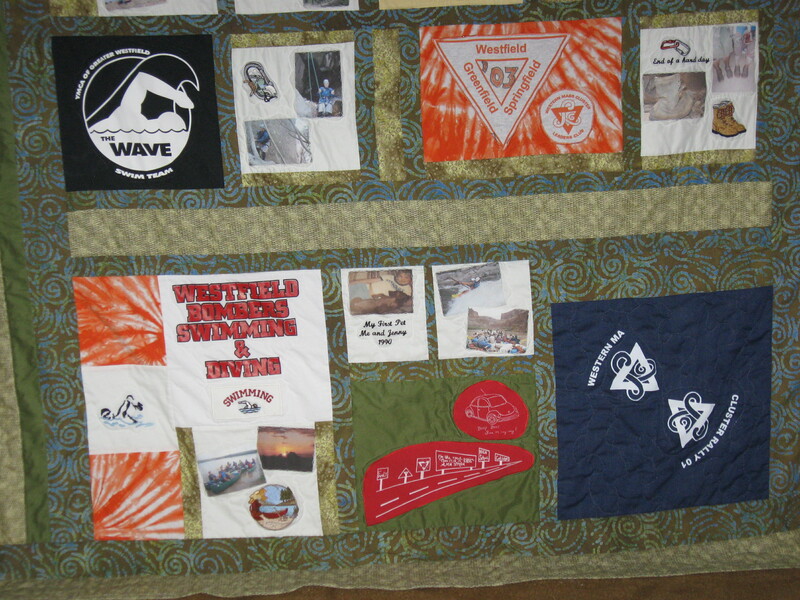 Embroidered Designs and Photos may also be added. Almost anything is possible! 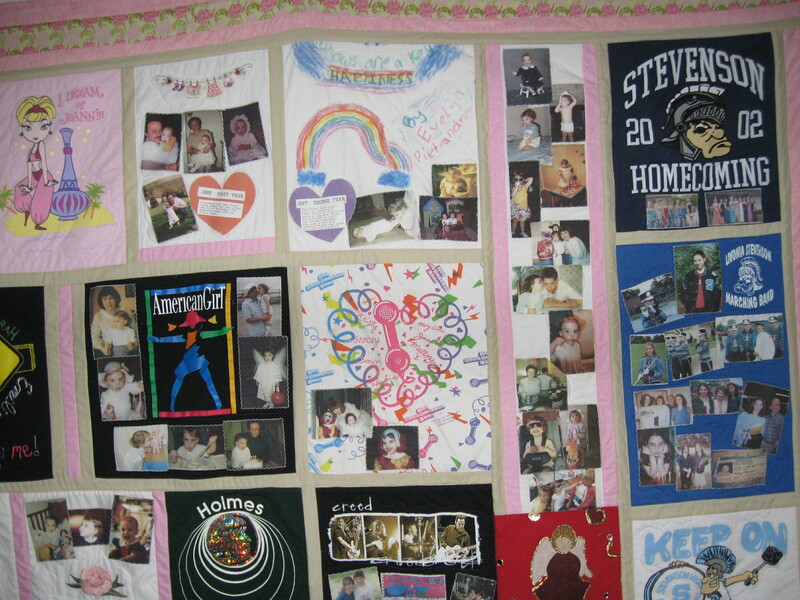 This Quilt 65 x 76"
(due to extensive designs) Cuddle up in all your favorite memories! 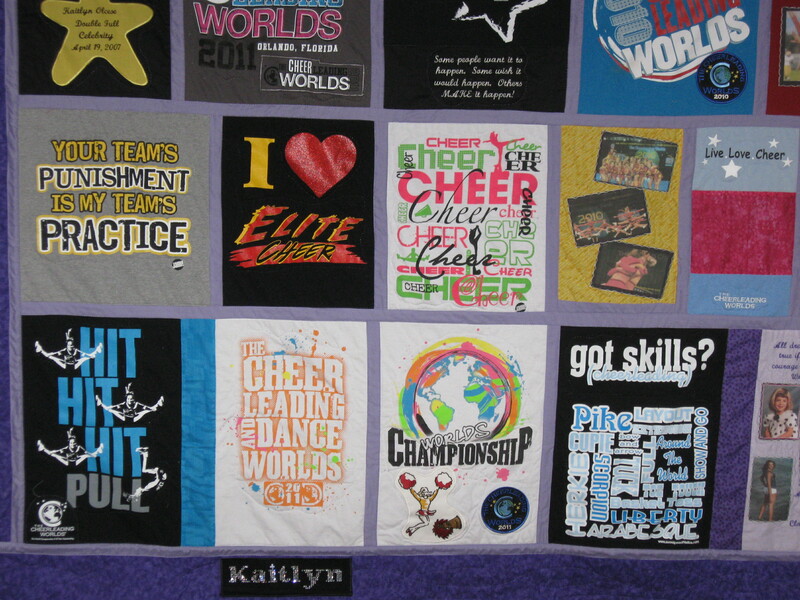 Clothing items, T-shirts, Designs, Wording and more added! 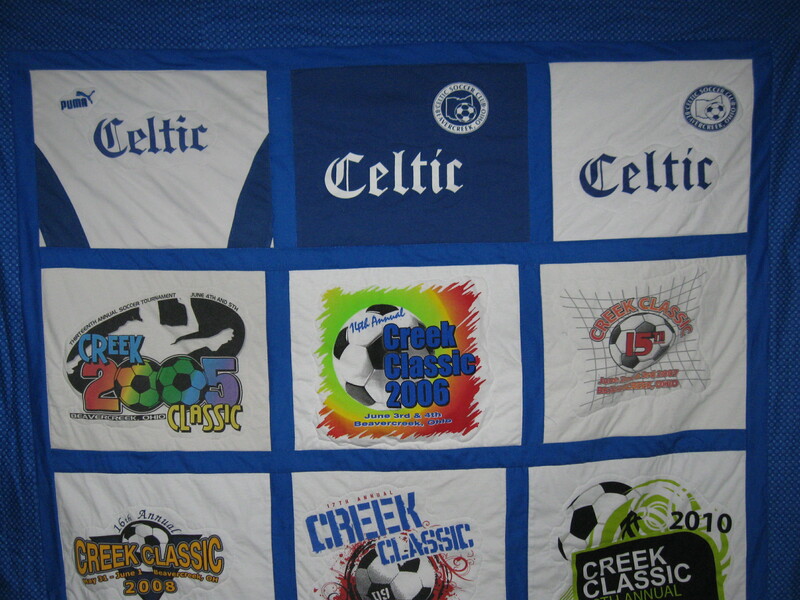 We have Embroidered Designs for almost any theme imaginable-just ask! 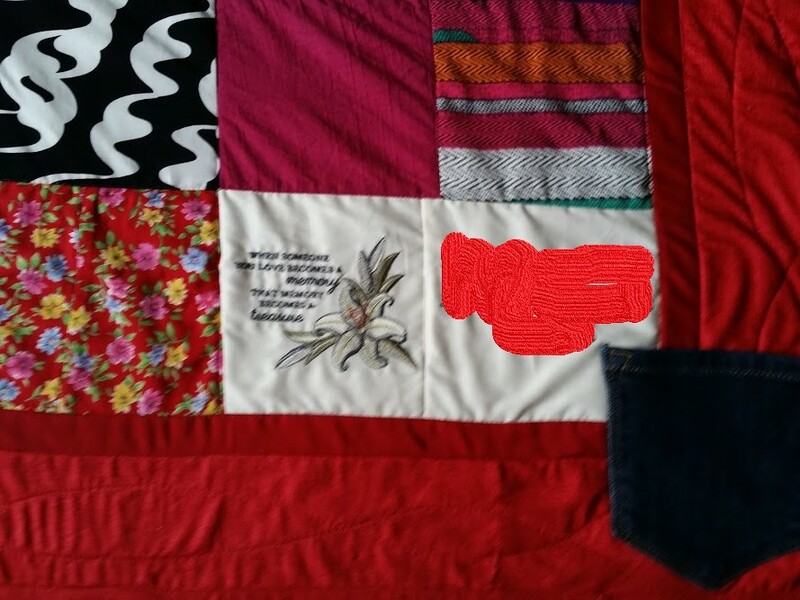 This Quilt 69 x 90"
Approx. $300. 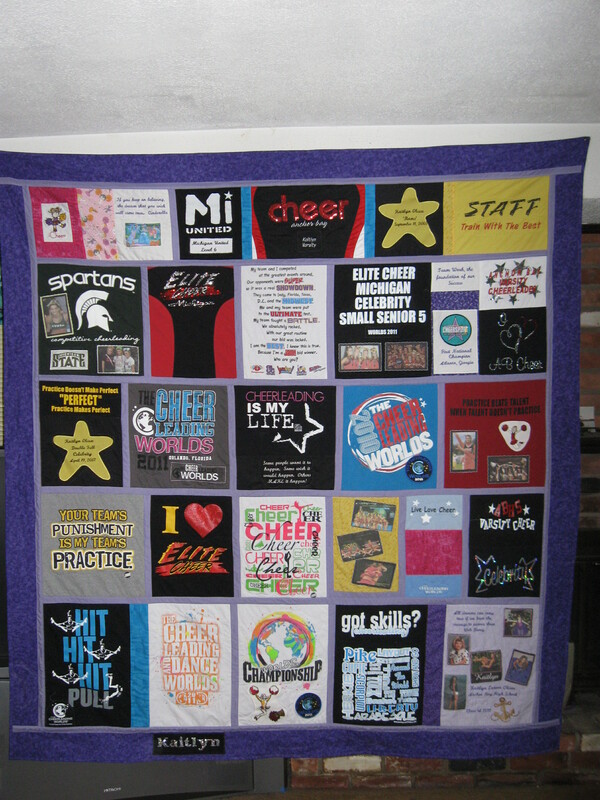 Any number of T-shirt panels and/or Clothing Items may be added! 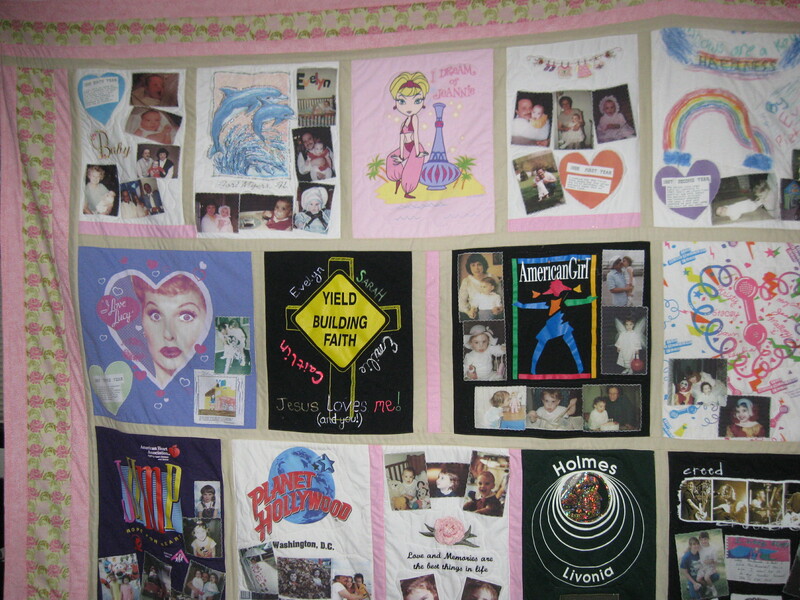 This Quilt 61 x 66"
This Quilt 92 x 103"
34 T-Shirt Panels and 162 Photos-wow! 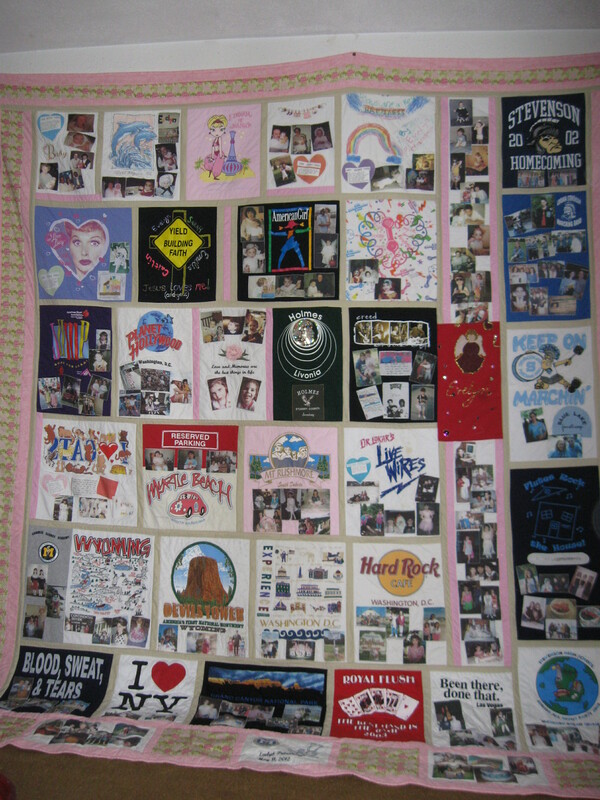 A lifetime of memories at a glance! 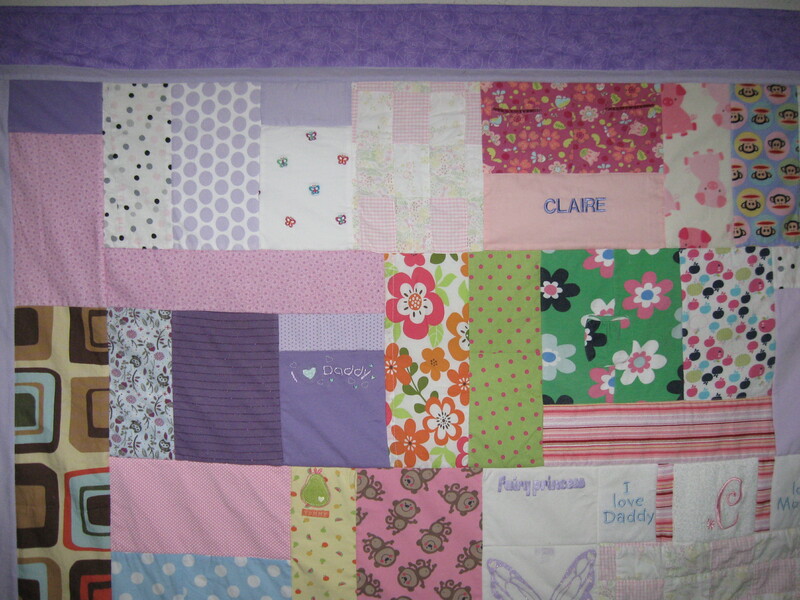 A wonderful way to preserve those precious 'little' memories and display your Baby's clothing items! 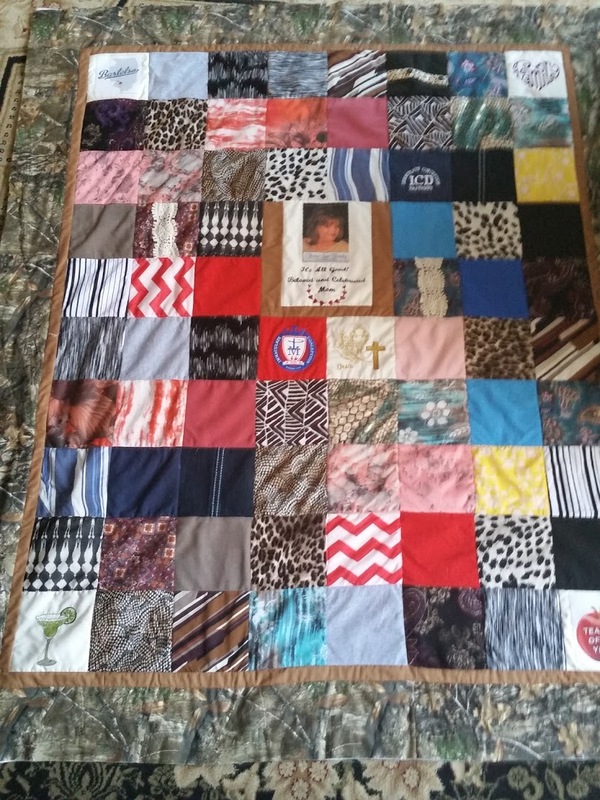 Backed with Fleece for a super soft and warm Quilt! 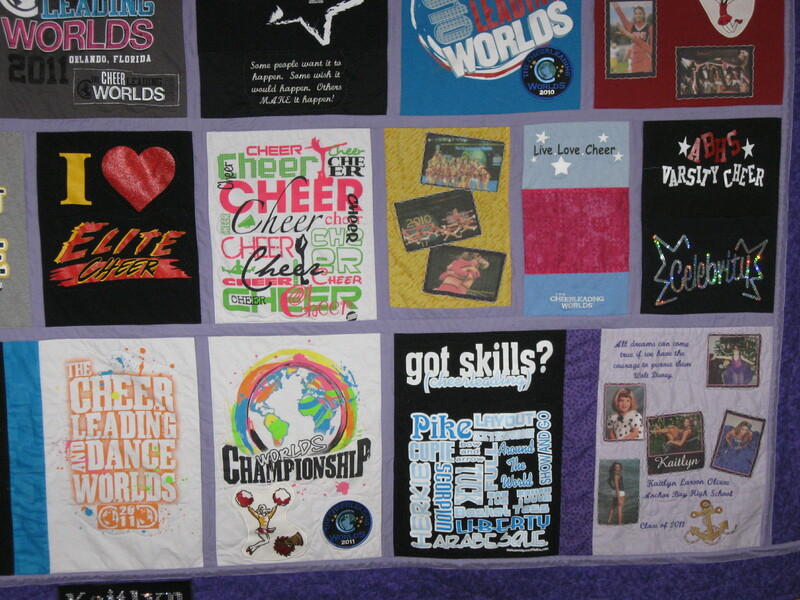 Team Fabric sometimes available-just ask! 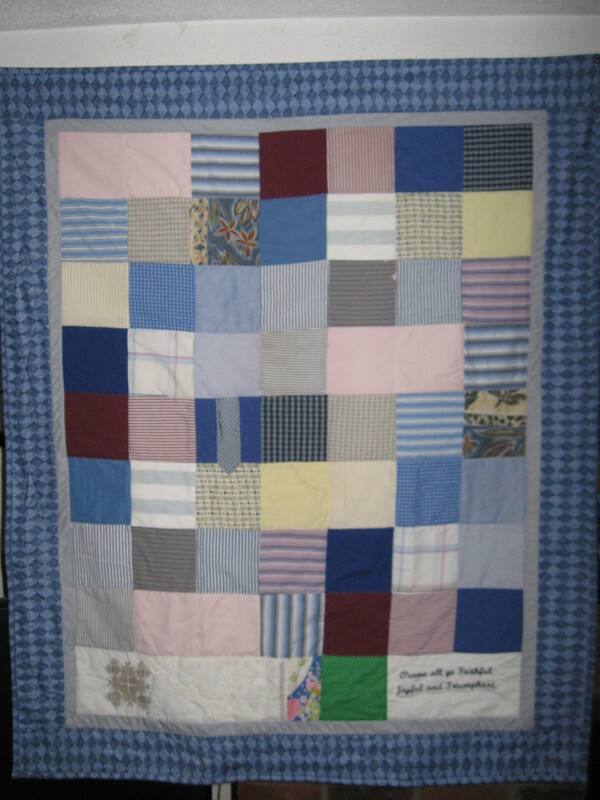 This Quilt 41 x 49"
This Quilt 75 x 85"
Approx. $400. 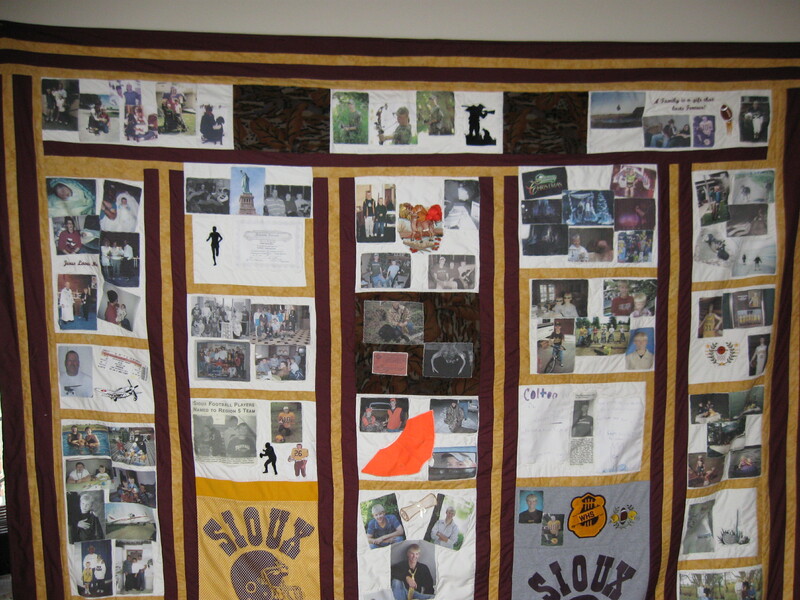 Multi photos, Wording and Designs added Almost anything is possible, just ask! 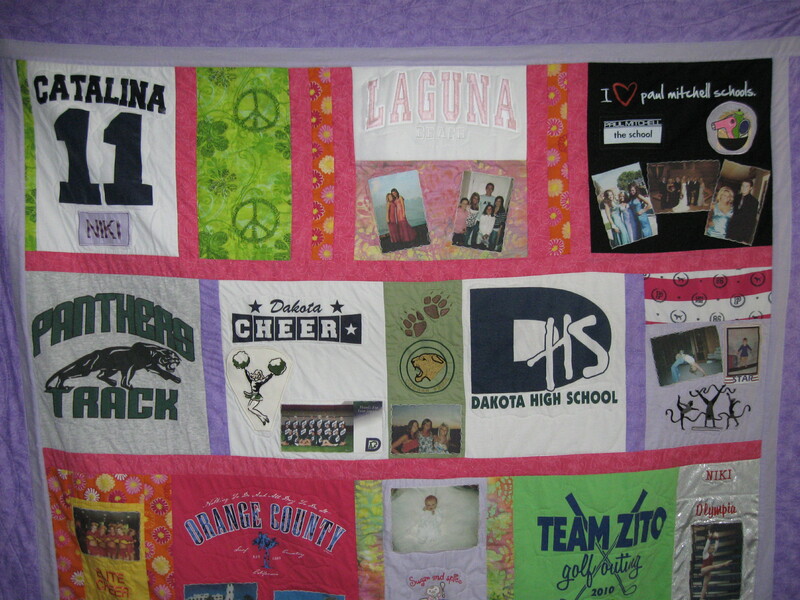 This Quilt 72 x 90"
This Quilt 80 x 90"
Approx. $320. 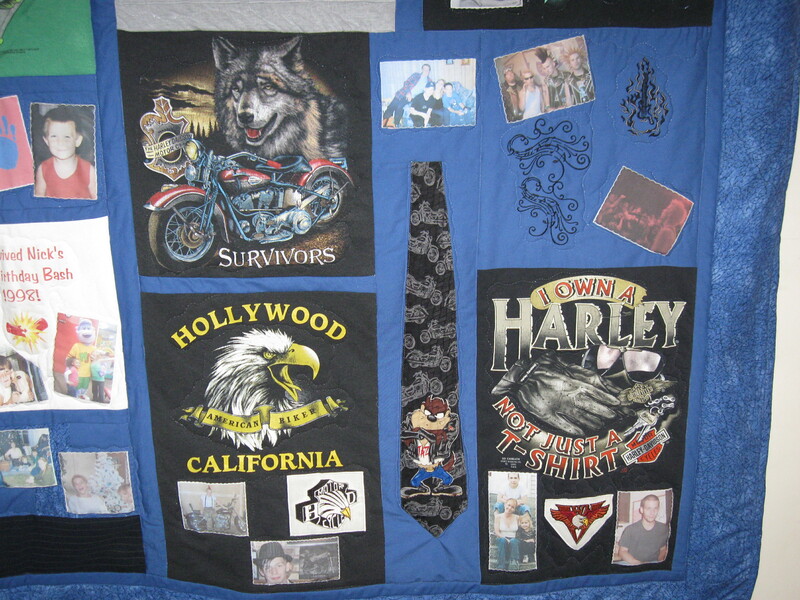 Bandana's added along with Tee's, Photos, Designs and Wording Almost anything is possible, just ask! 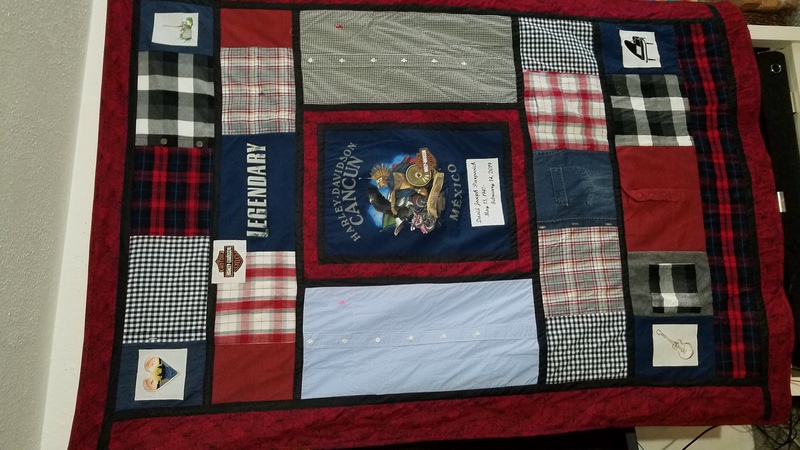 This Quilt 56 x 64"
Approx. $250. Simple and fun! 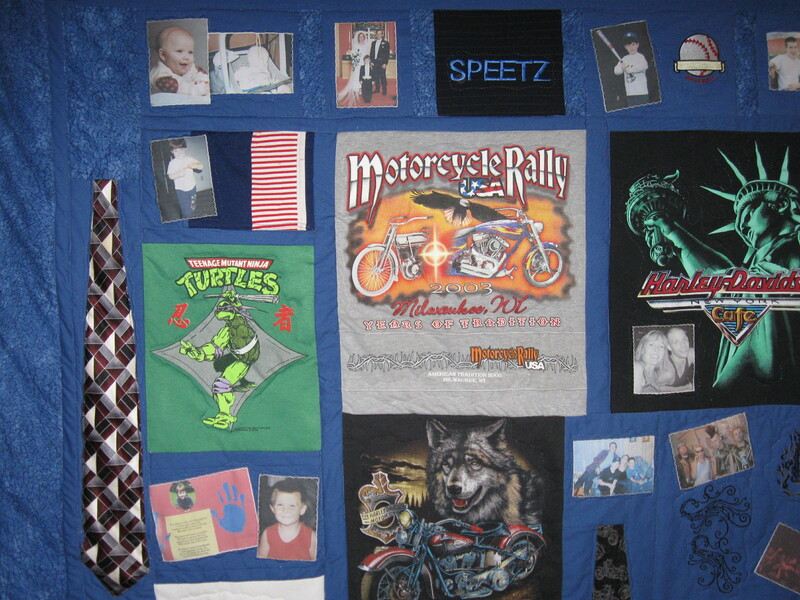 The perfect way to combine all your T-shirts into one great Keepsake! 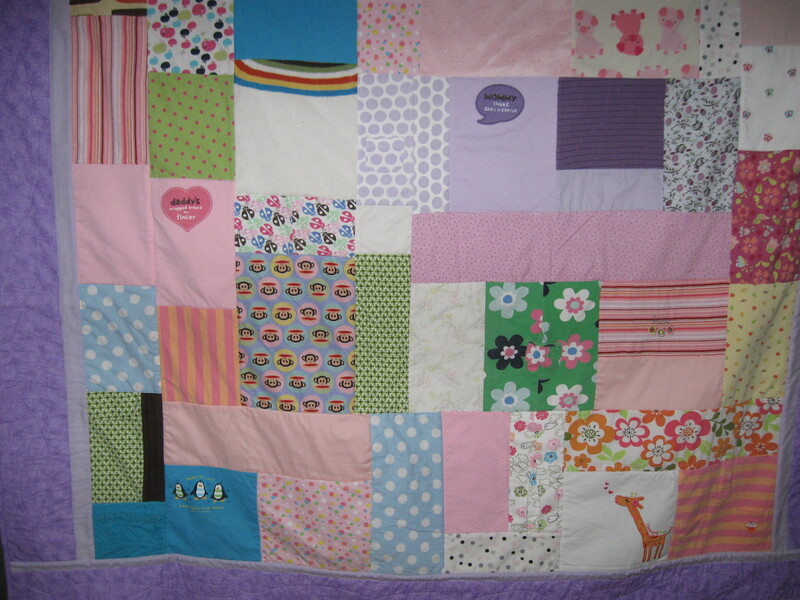 Backed with Fleece making the Quilt super soft and cuddly! 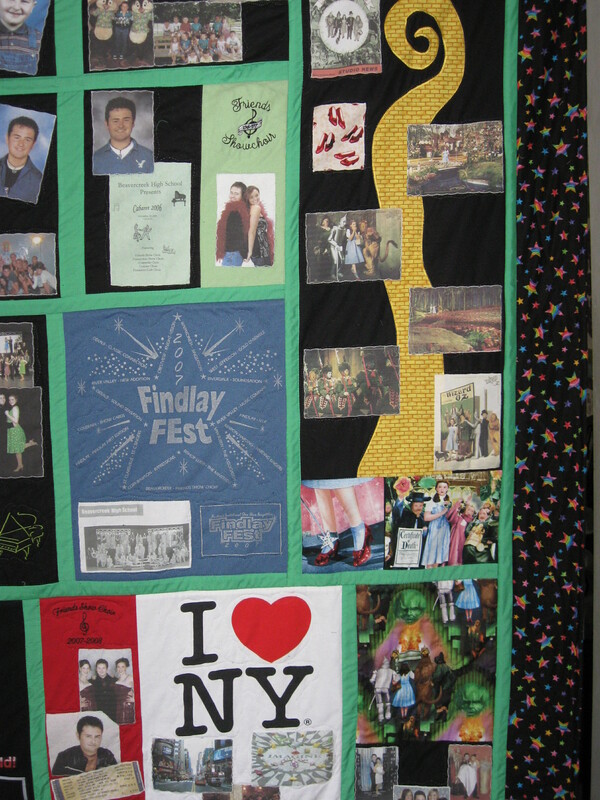 This Quilt 64 x 82"
This Quilt 66 x 86"
Approx. $280. 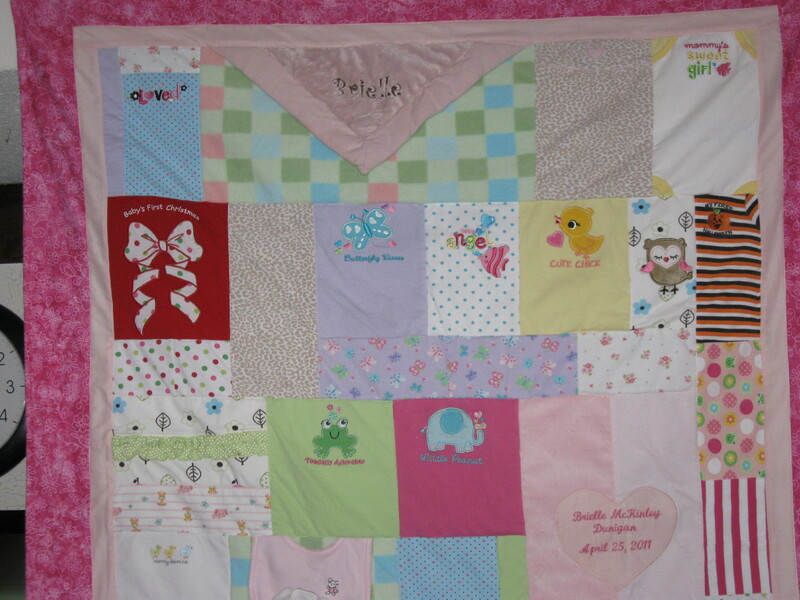 Off-set Patchwork Style using Baby Clothes, Blankets, Bibs and more! 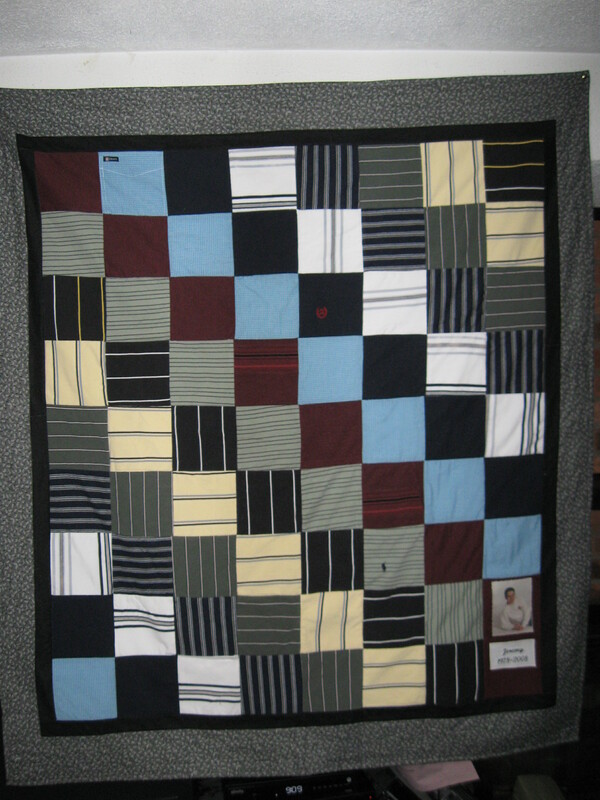 Fleece backing makes the Quilt super soft and warm-perfect to cuddle up in! 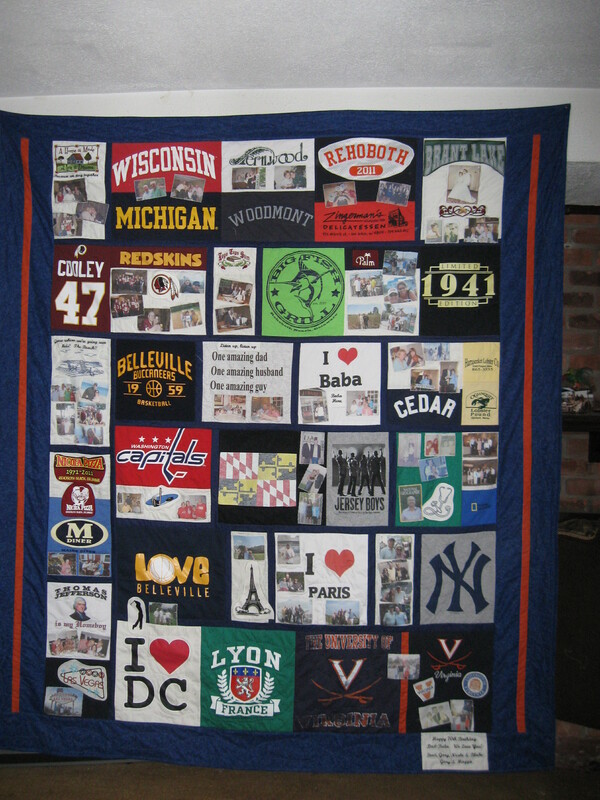 This Quilt 76 x 90"
Done in any color and fabric style-your choice! 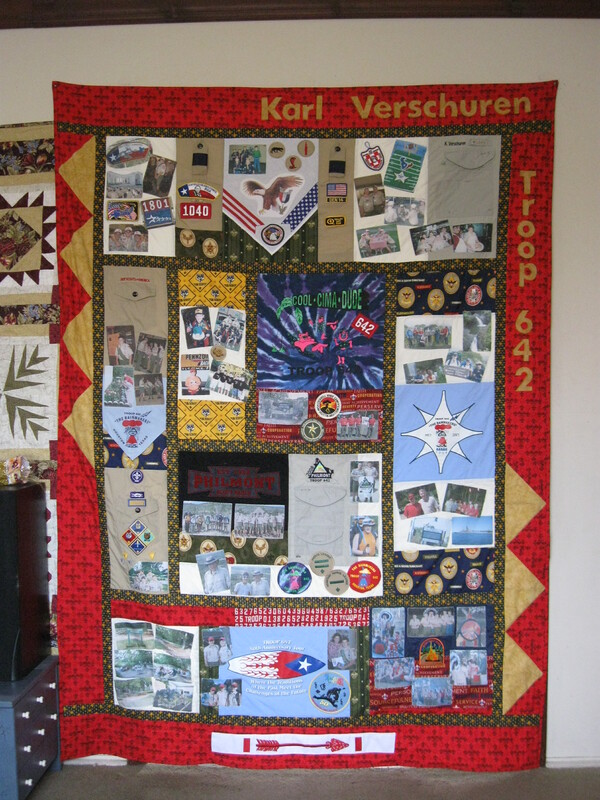 This Quilt 70 x 82"
This Quilt 64 x 79"
Approx. $280. 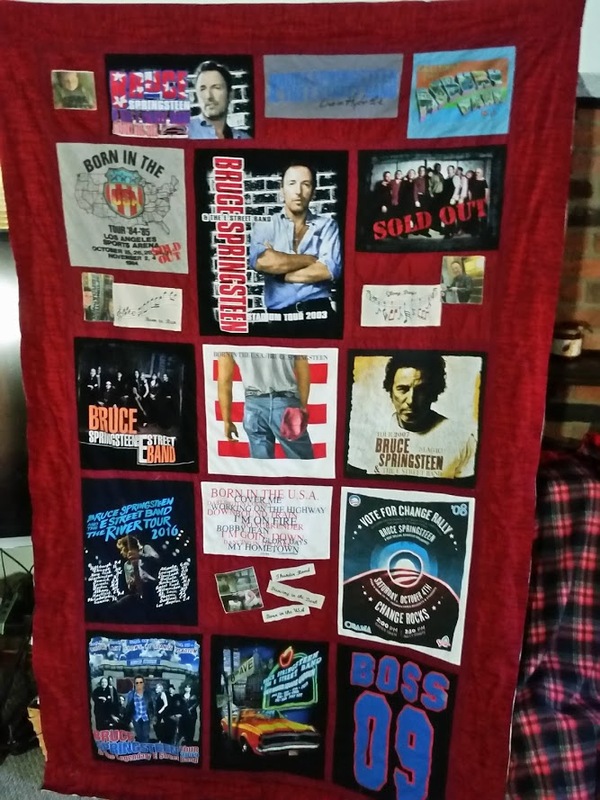 Done in your choice of colors, fabric style, etc. 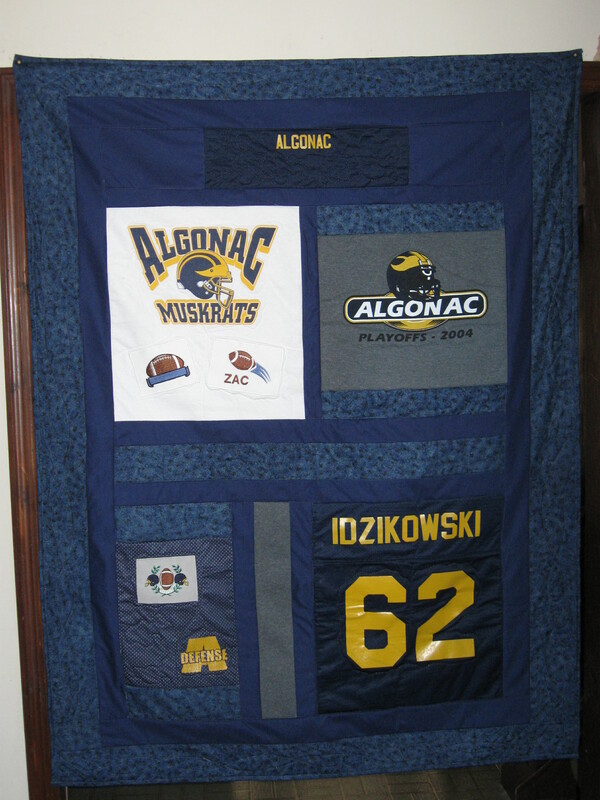 Graduate's name appliquéd larger on top border! 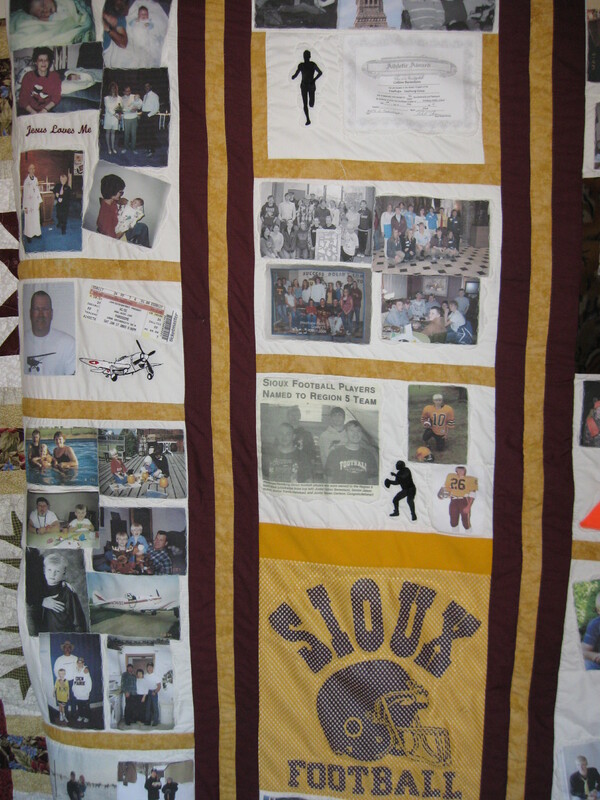 This Quilt 87 x 102"
This Quilt 76 x 87"
Approx. $320. Approx. 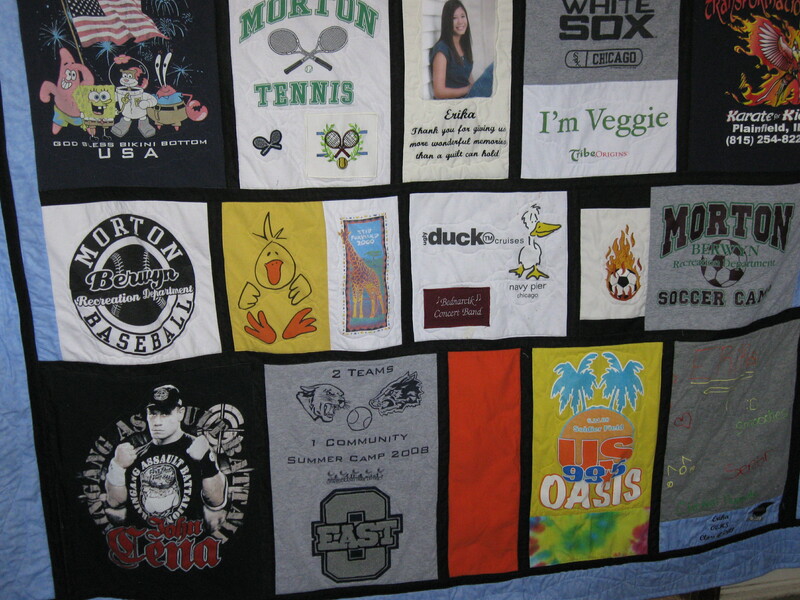 30 T-shirts used in this quilt! 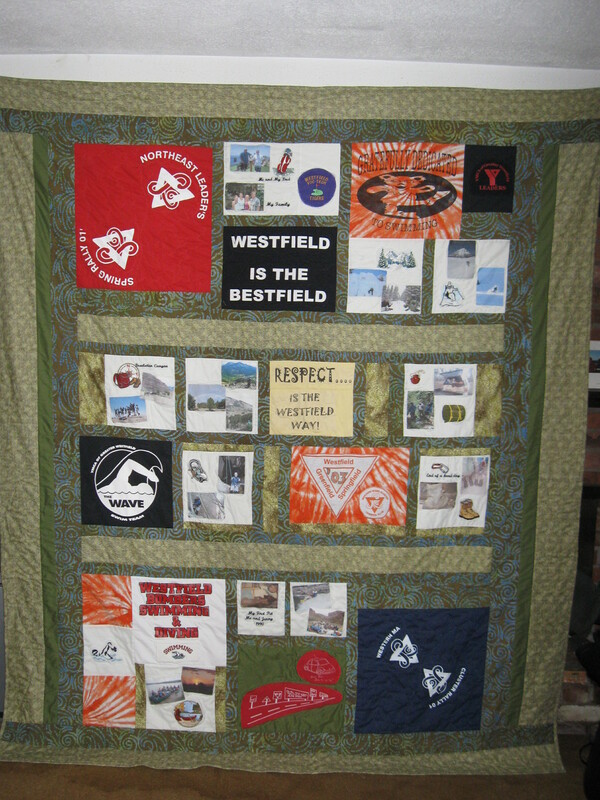 Wording, Designs and Photos may also be added. Approx. $160. 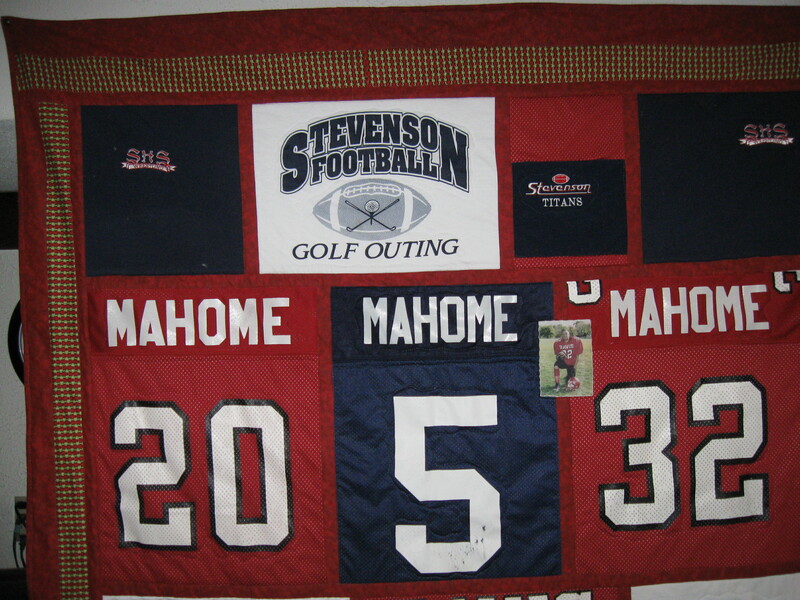 Many Sports Embroidery Designs available We can also add photos! 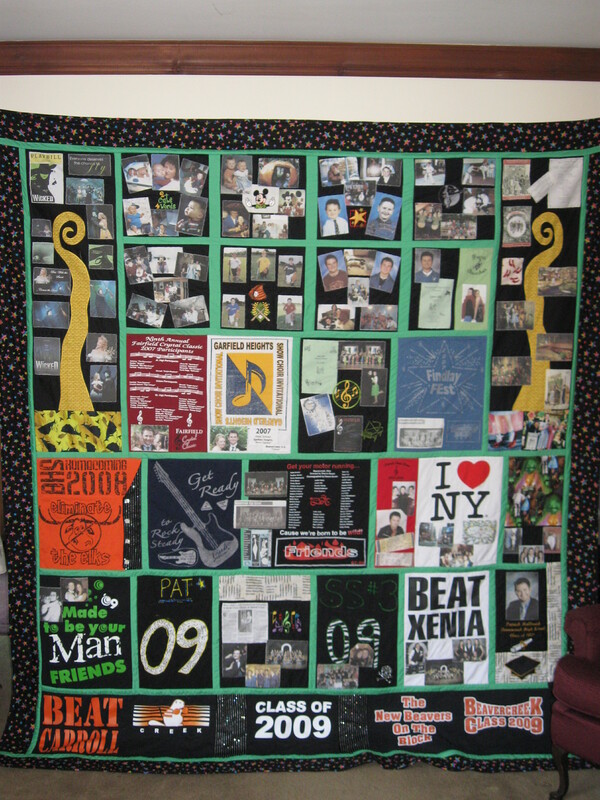 This Quilt 50 x 60"
This Quilt 71 x 93"
Approx. $300. 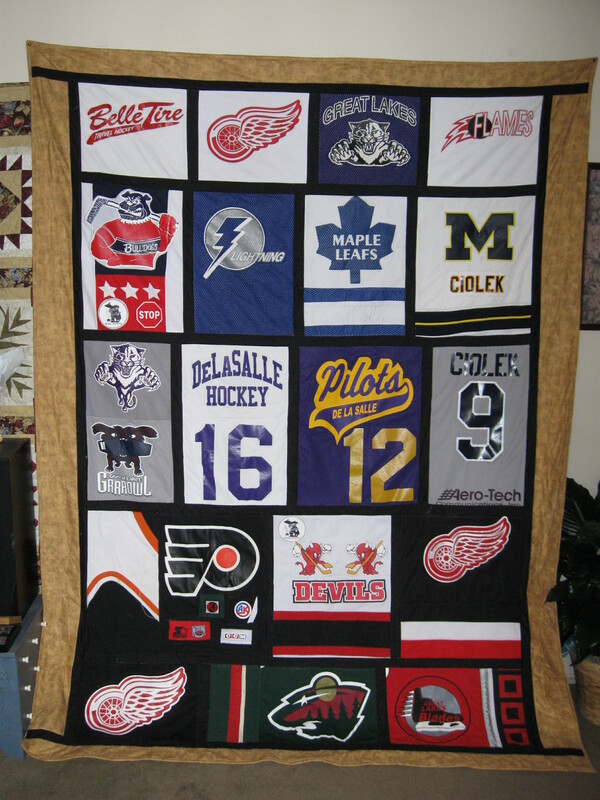 Multiple Hockey jersey's used to make this a perfect sports themed Quilt! 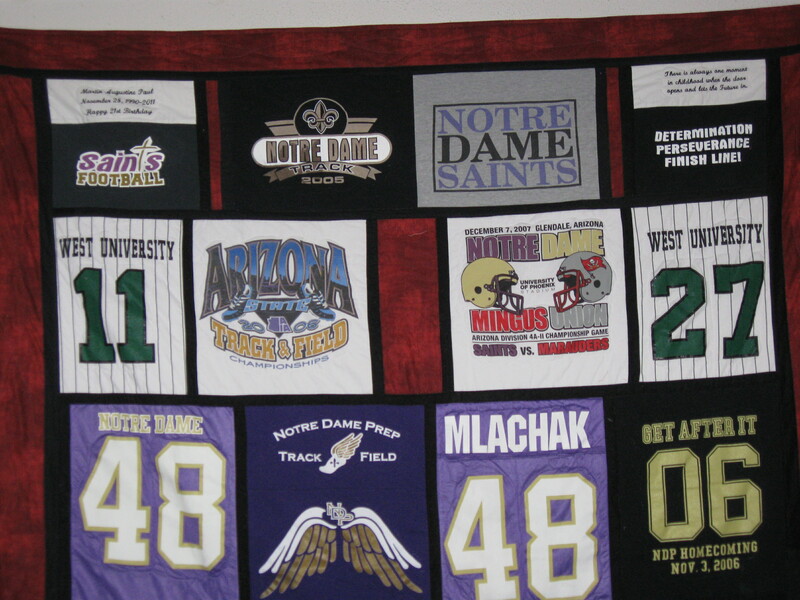 We have many sports designs also available-just ask! 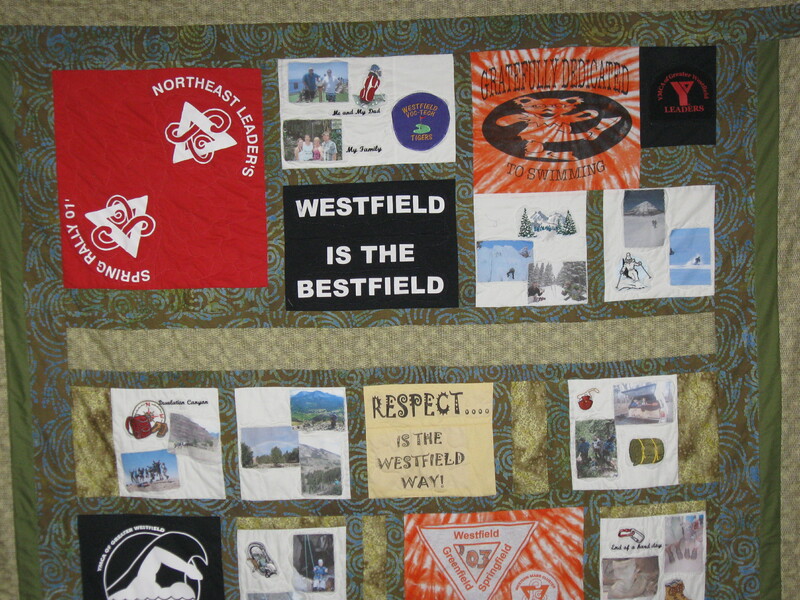 This Quilt 70 x 81"
Fleece backed for a cozy quilt! 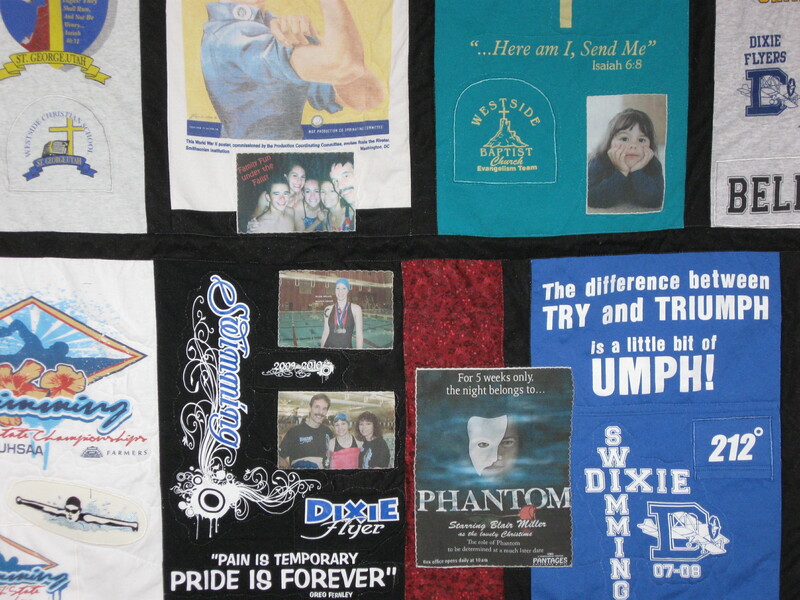 Many Music Themed Embroidery Designs available. 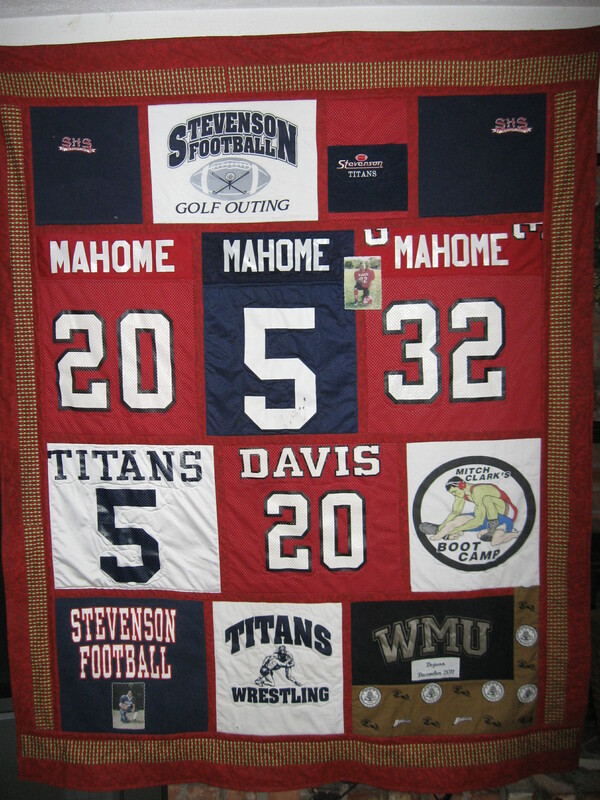 Any size available to accommodate all your special memories! 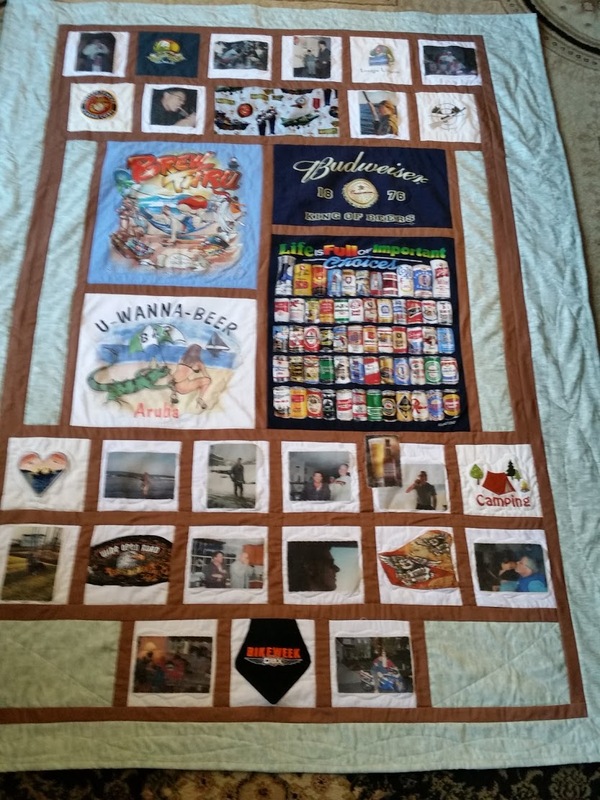 This Quilt 62 x 84"
Approx. $380. 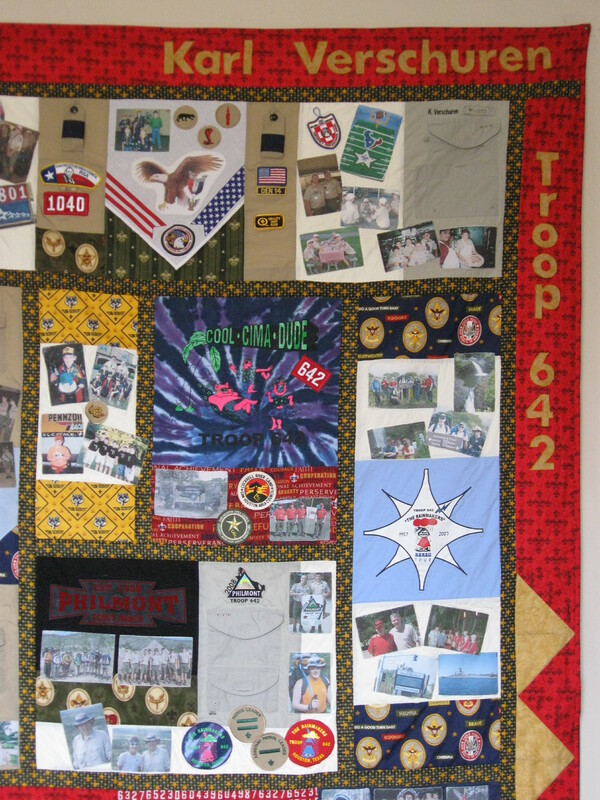 Licensed BSA fabric available-Clothing Pieces, Patches, Applique, Photos and more added! 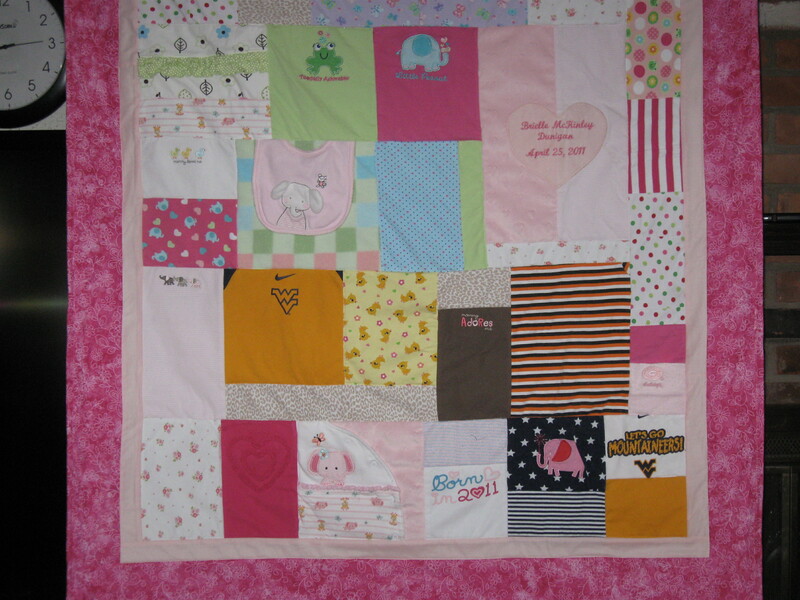 This Quilt 66 x 78"
Clothing pieces added as to not loose the character and design of the outfits! 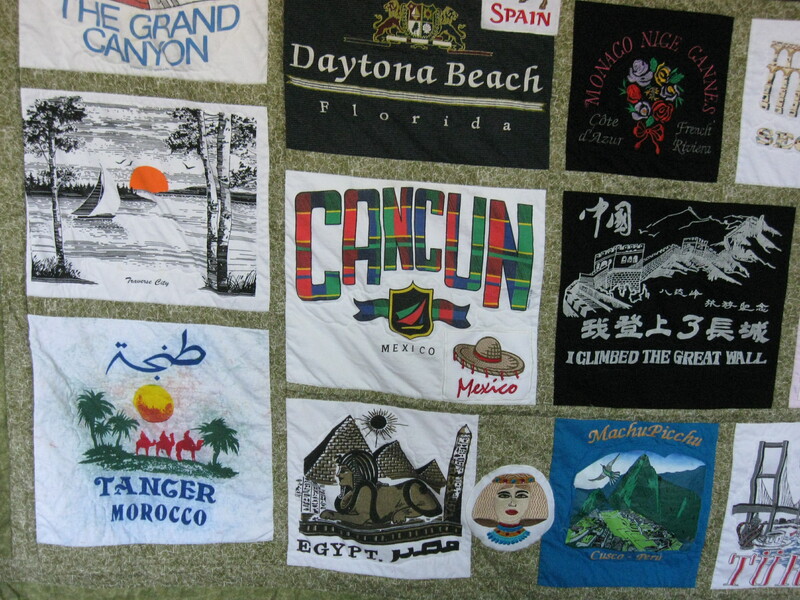 This Quilt 82 x 80"
35 T-Shirt panels used plus a wonderful variety of 'Travel' Themed Embroidered Designs help create this Vacation Keepsake Quilt. 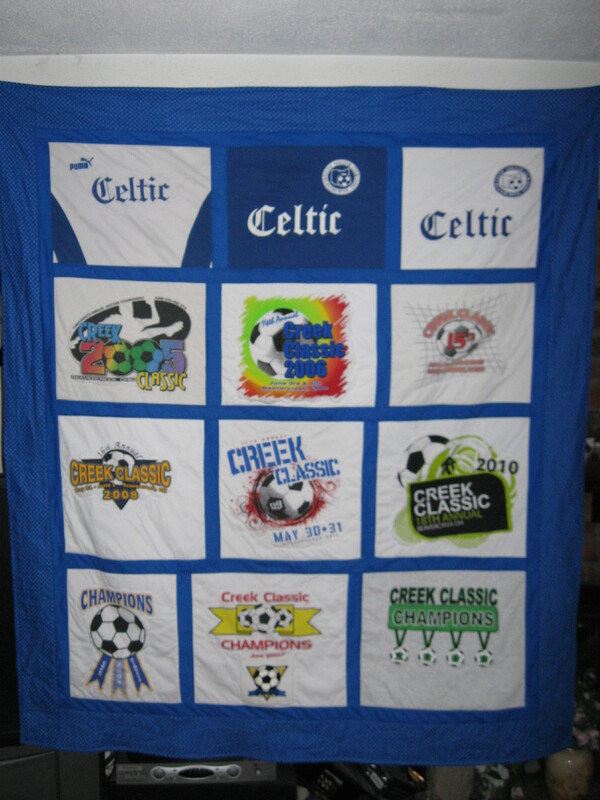 Any size, color and theme available, just ask! 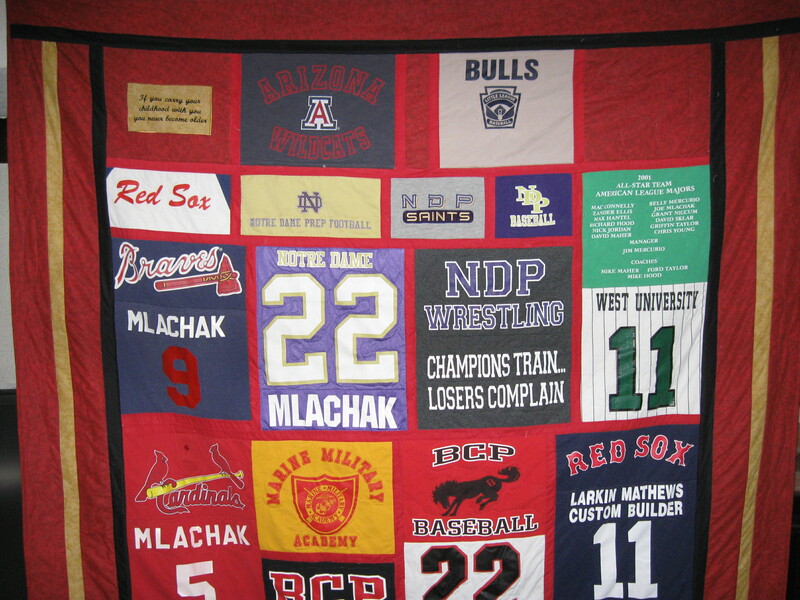 Embroidered Designs in almost any theme also. 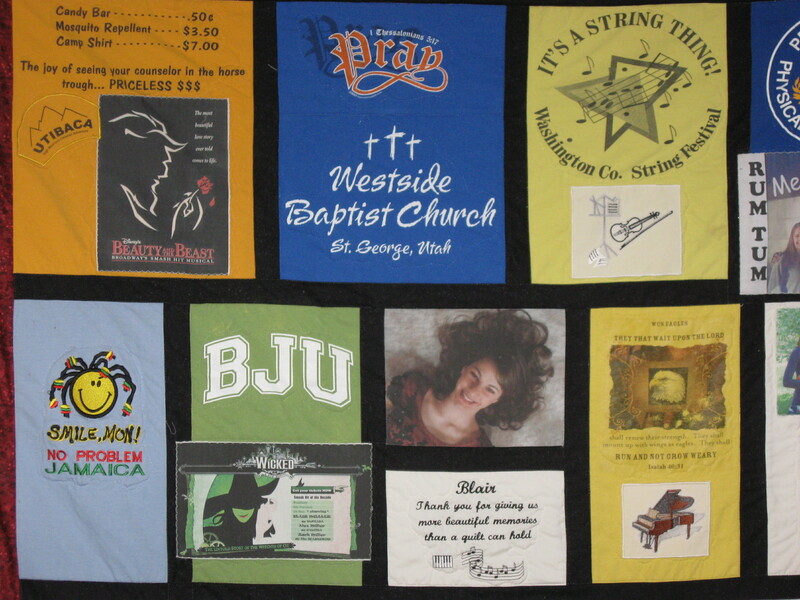 T-Shirt Panels, Appliqués, Clothing Pieces and more added! 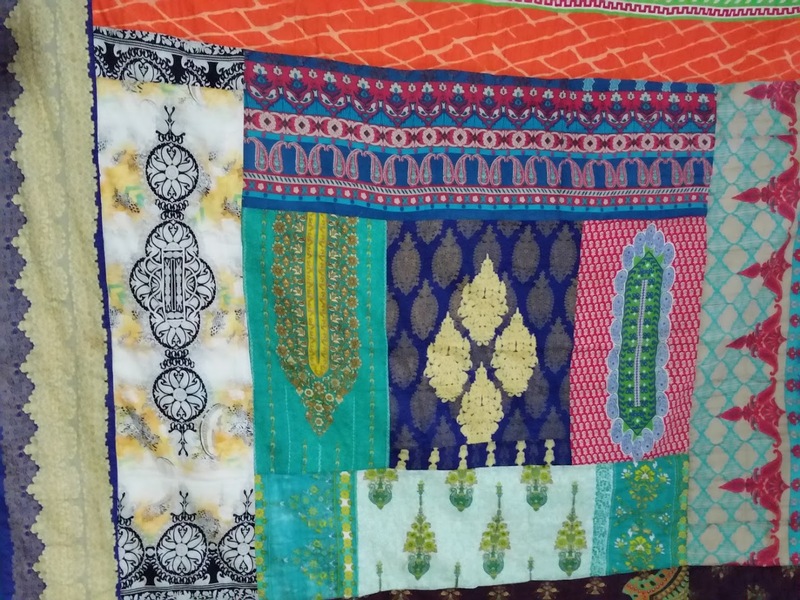 This Quilt 58 x 70"
$420. 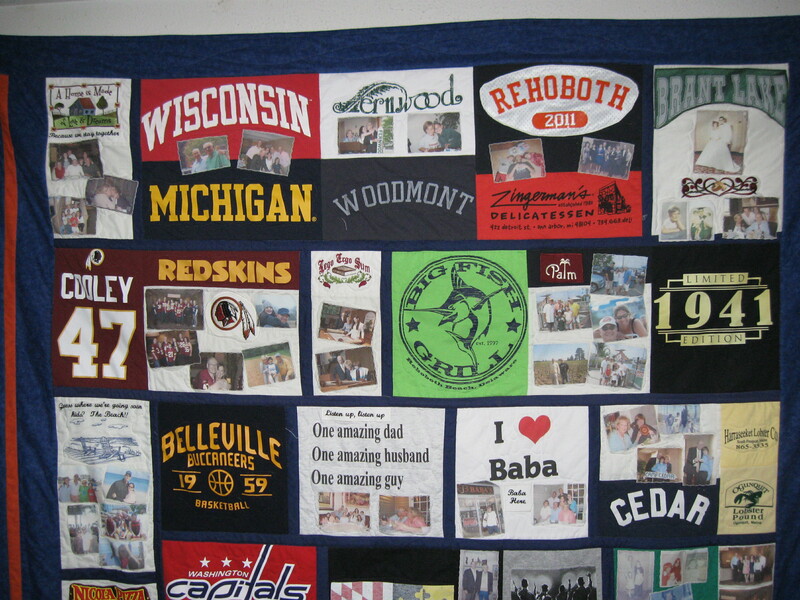 T-shirt and clothing pieces used to create a personal Memory Quilt Photos, Embroidered Wording and Designs add. Fabrics in almost any Theme also available. 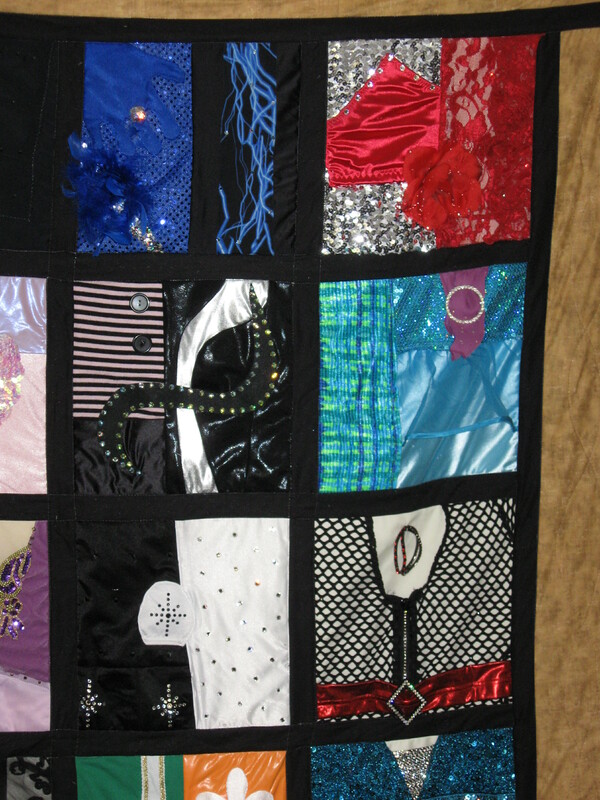 Over 50 Dance Costume pieces used plus multi-Embellishments and Trims. 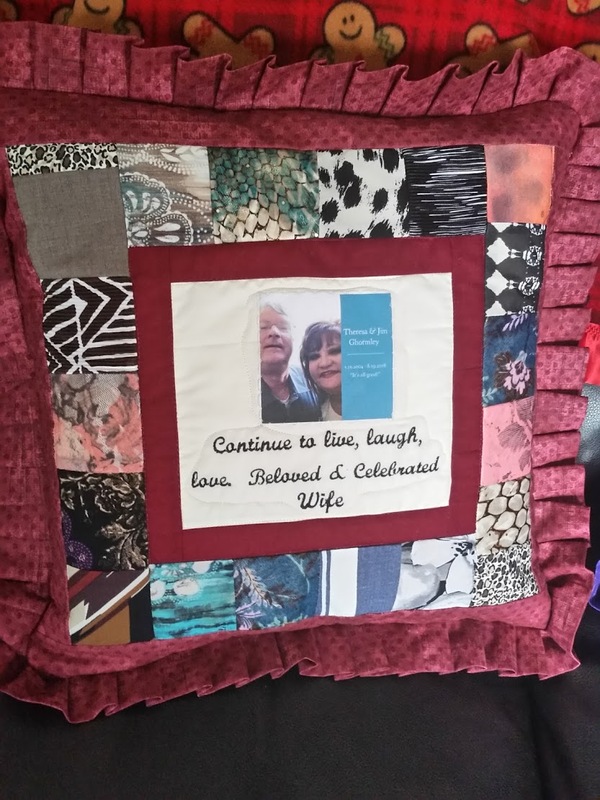 Capture each special moment in one Fabulous Quilt! 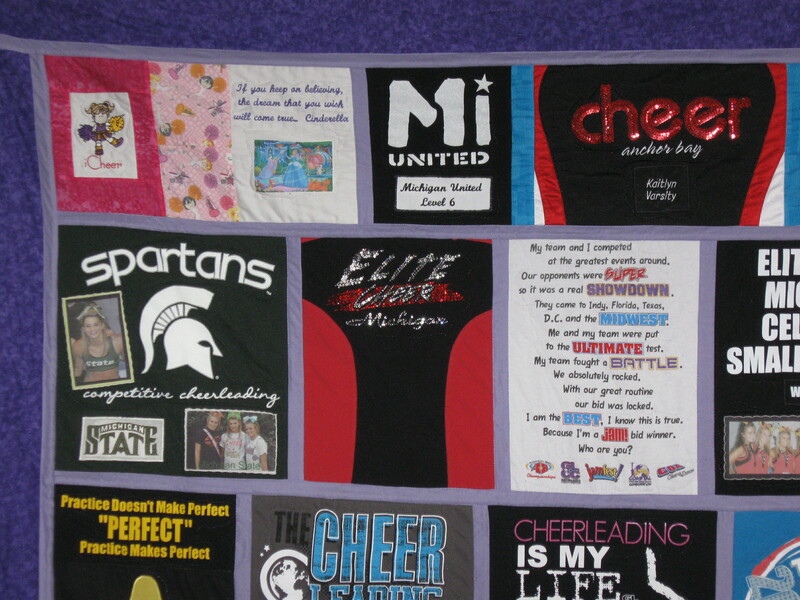 This Quilt 60 x 70"
Dance Costumes used to create a lifetime of memories in Dance! 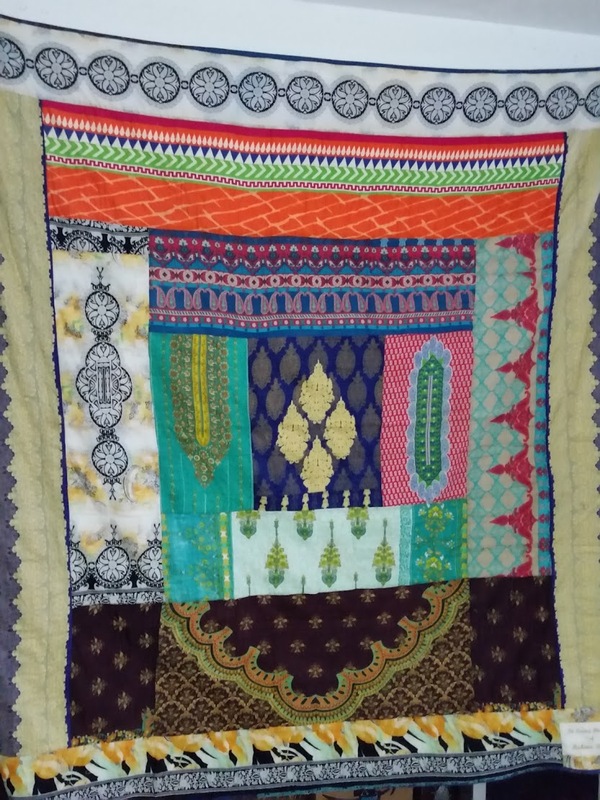 Your choice of colors and fabric style for borders. 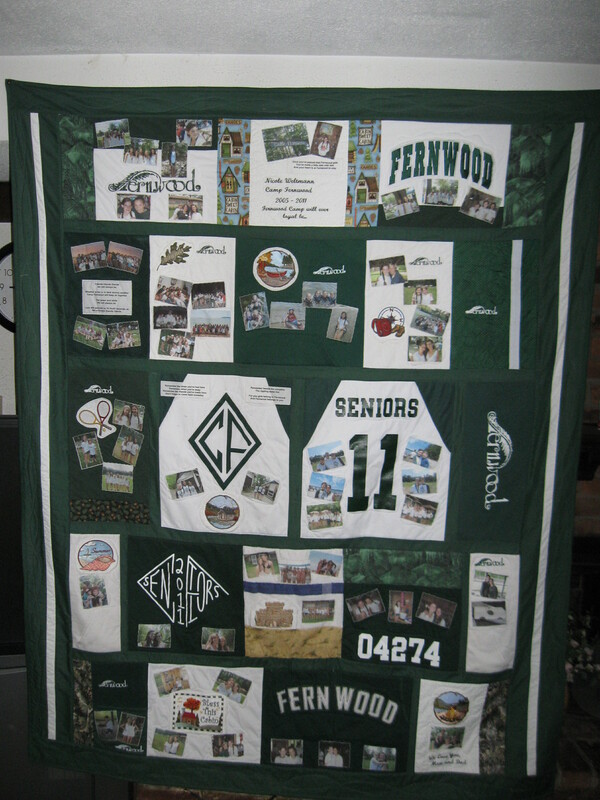 Photos & Embroidery may also be added. 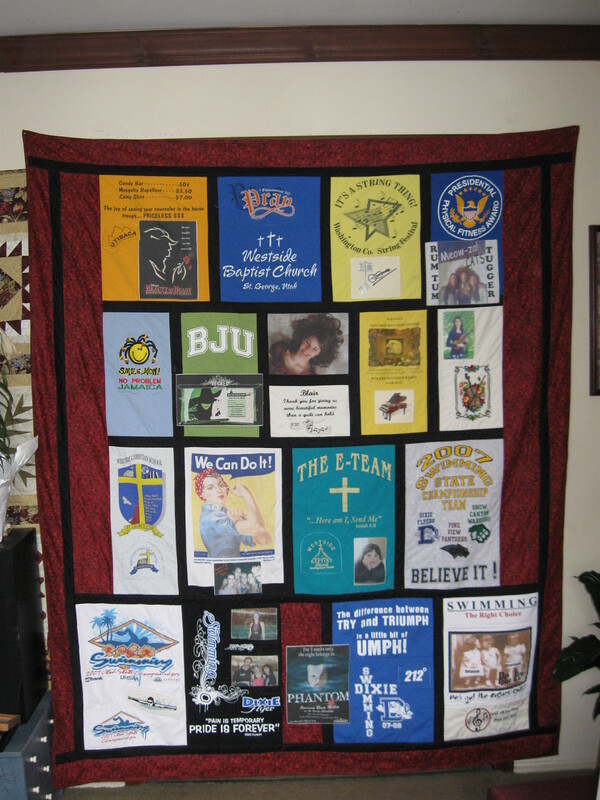 This Quilt- 57 x 75"
Almost anything is possible-just ask! 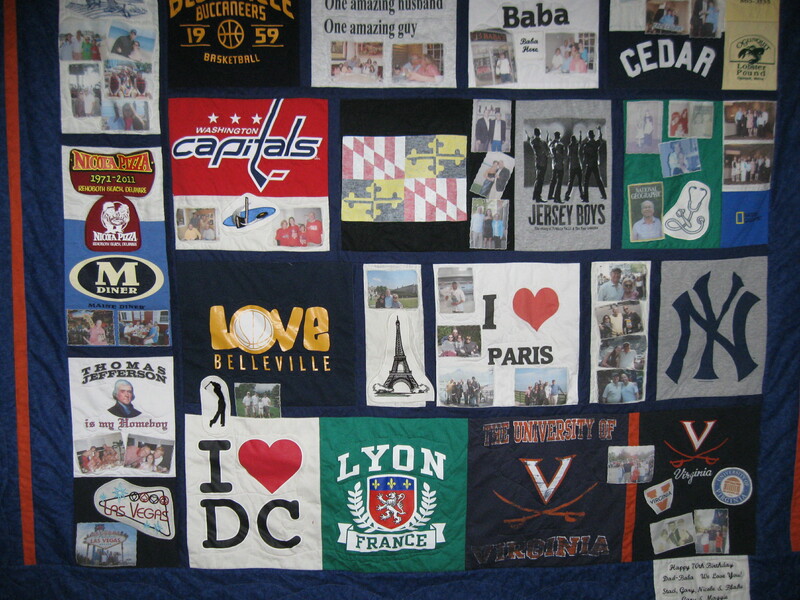 A Collection of Vacation Memories-clothing pieces added! 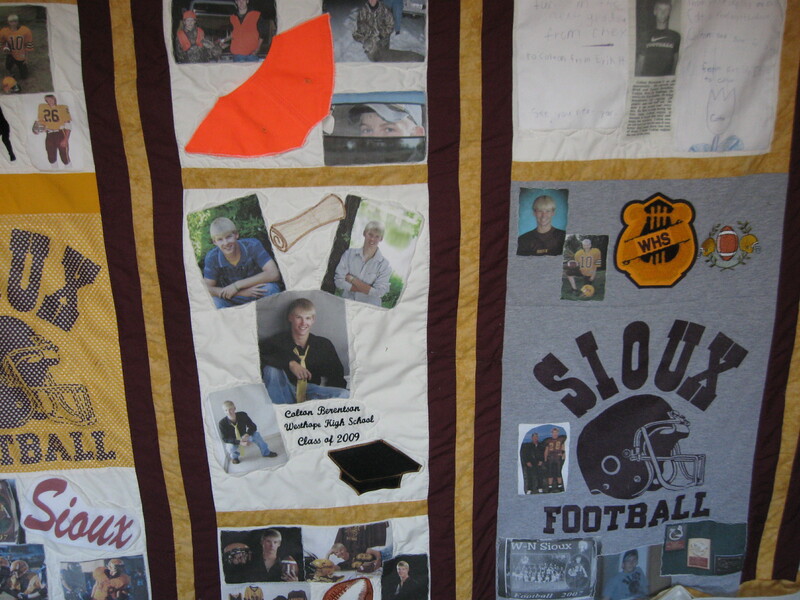 This Quilt 71 x 94"
Fleece added on Quilt back for warmth and comfort. 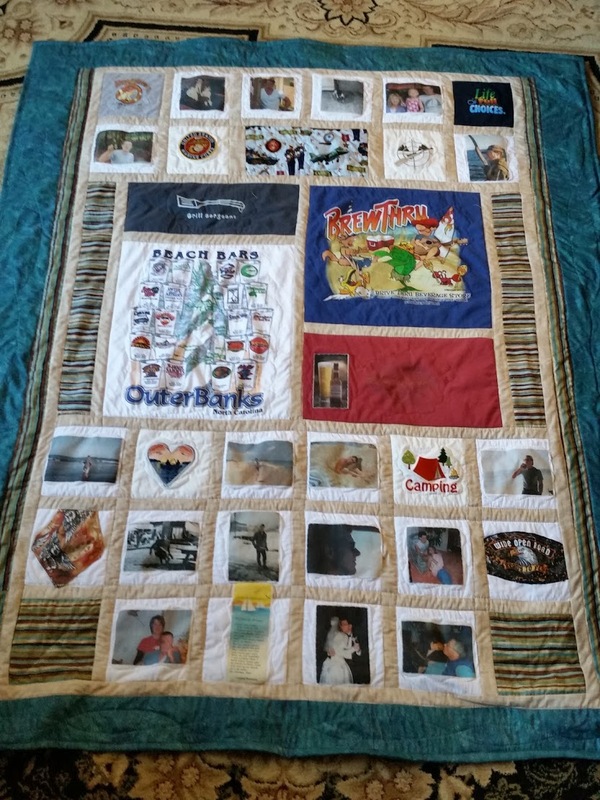 Combine T-Shirts with your Favorite Photos to Create a Totally Unique Quilt.